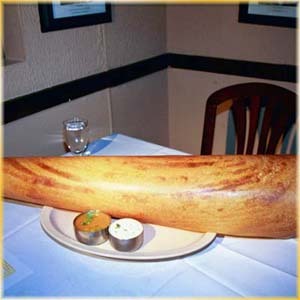 Here’s a north Indian dish you’ll rarely find in a restaurant, at least in America. I’m not sure why; it’s delicious and the ingredients can be found year-round. I had it once at Rasika and never saw it on their menu again, which is why I learned to make it myself. 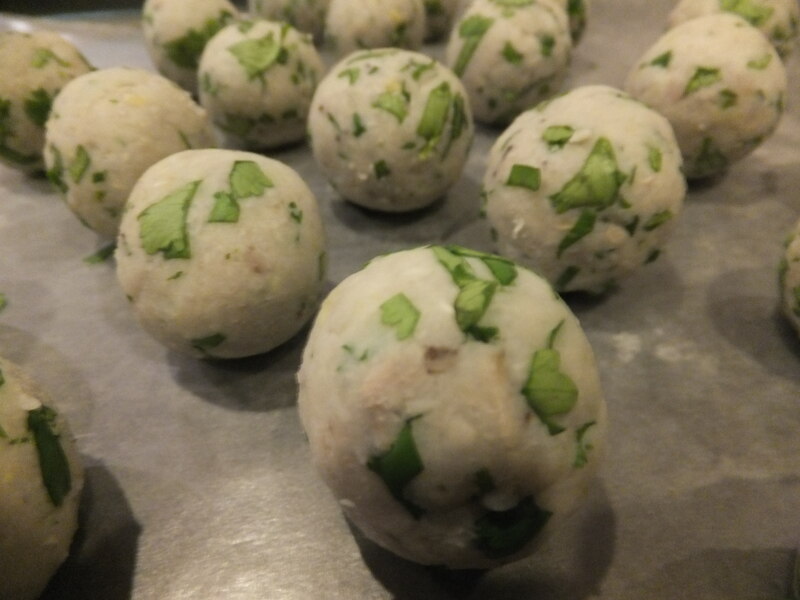 A kofta is a fried dumpling and may be made with a variety of vegetables and/or paneer. Here, cooked, starchy plantains are mashed with finely chopped cashews and seasonings, then fried and served with a rich, complex tomato gravy. Omit the small amount of butter in the gravy and it’s vegan. Why did I wait so long? It’s not difficult (especially if you have a deep-fryer. Note: get a deep-fryer!) and the gravy and uncooked plantain balls freeze very well. We had some recently that had been frozen for about 4 months and they were as good as fresh. 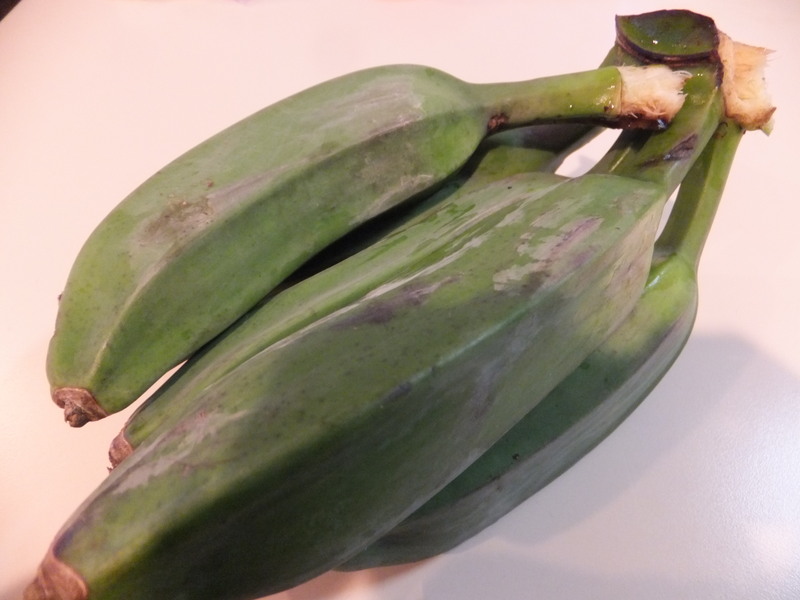 Cut plantains into 2-inch lengths and place in a large pot with water to cover. Boil until soft but not falling apart (you’ll be mashing them like potatoes), about 20-30 minutes. Drain. Cooked plantains. They look kind of dull now, but just you wait! 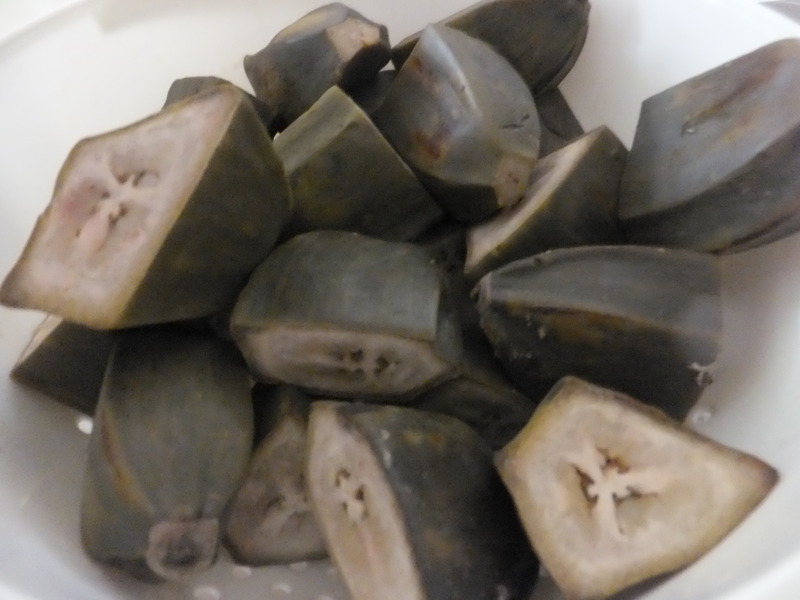 Once cool enough to handle, peel and mash in a large bowl. A potato ricer works well here. 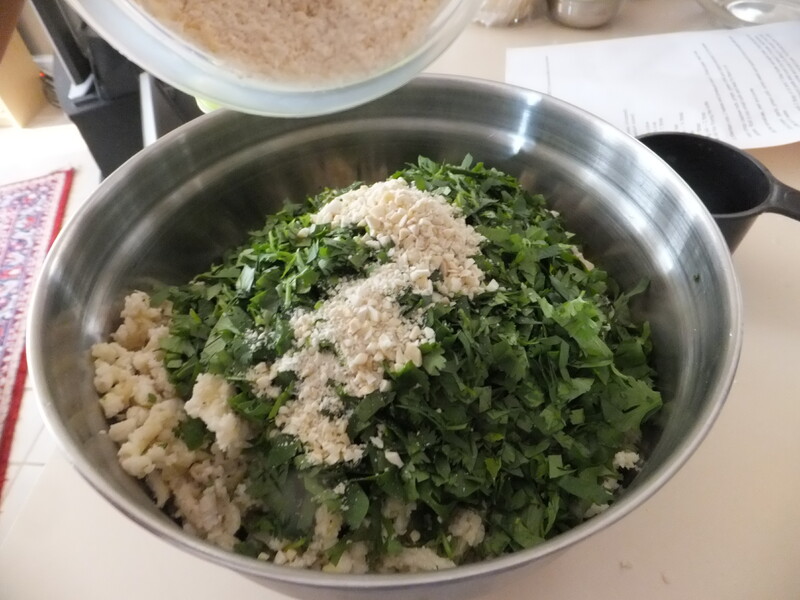 Add chopped cashews, grated ginger, minced green chili, and cilantro and mix well. Cover and set aside while you make the gravy. 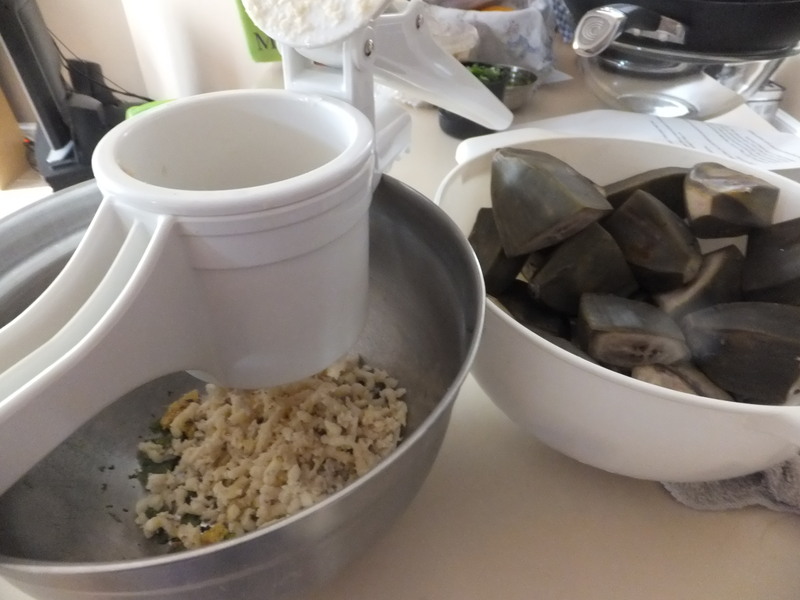 Grind ginger, garlic, green chilli, cumin seeds and cashew nut into a smooth paste with a little bit of water. Set aside in a small bowl, covered. Puree the tomatoes and set aside. Doing them in this order means you don’t need to clean the blender in the middle, plus you can leave the pureed tomatoes in there until they get added to the pot! In a large pot, sauté onion in 2 tbsp oil and 1 tbsp butter. 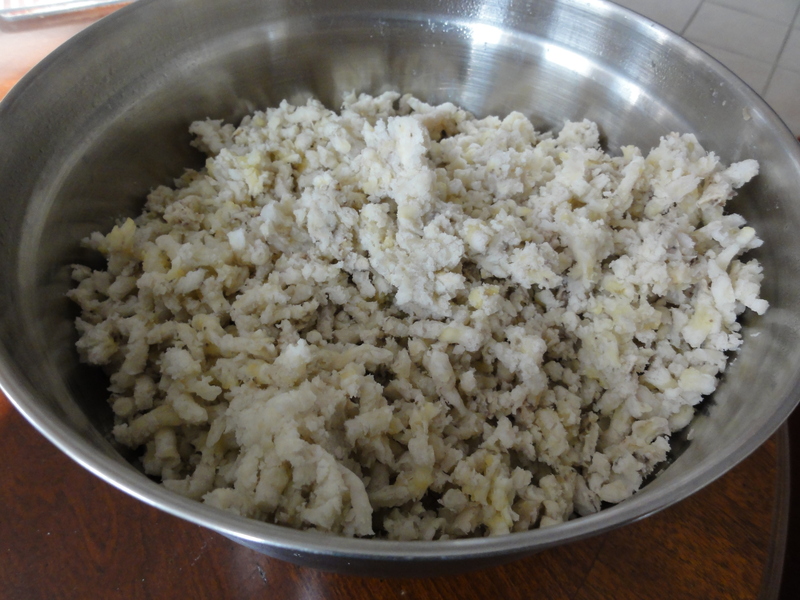 Once the onion turns golden brown, add the ground cashew paste and cook it for about 2-3 minutes, stirring constantly. Stir in turmeric, chilli powder, and salt. Add tomato puree and cook for about 5-7 minutes. If the gravy is thicker than spaghetti sauce, add a bit of water. When you see oil on the surface of the gravy, turn off the heat. Now it’s time to fry the koftas. Heat 3 inches of oil to 375° F in your deep fryer or a large pot. 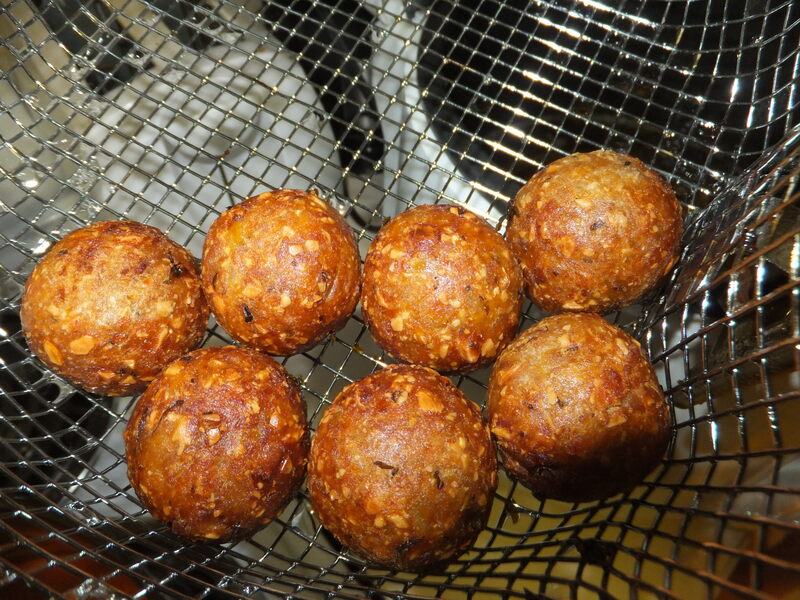 Form 1.5-inch-diameter balls from the plantain mixture and fry 4-5 at a time for 4-5 minutes or until deep golden brown. 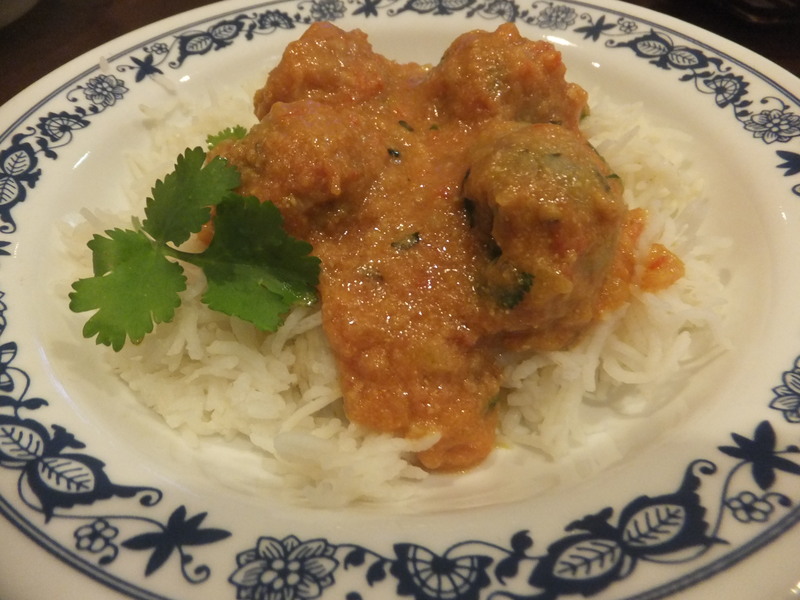 Add the fried kofta to the gravy, garnish with chopped cilantro and serve immediately over rice or with chapati, naan, or paratha. Serves 4-6. We visited Mintwood Place in Adams Morgan soon after it opened and made the grave mistake of not showing up hungry. Sure, I enjoyed the beet pie appetizer and a couple of cocktails, but left most of the menu unexplored. From the moment our meal began last week, all I could think was, why the heck did I wait so long to come back? Start with goat cheese and beet mountain pie (named by the Washingtonian as one of DC’s best vegetarian dishes) and the burrata, kales, hazelnut, apple & tamarind. Featured along with the recipe by Joe Yonan in the Washington Post a couple of weeks ago, this sort-of-salad will knock your socks off. 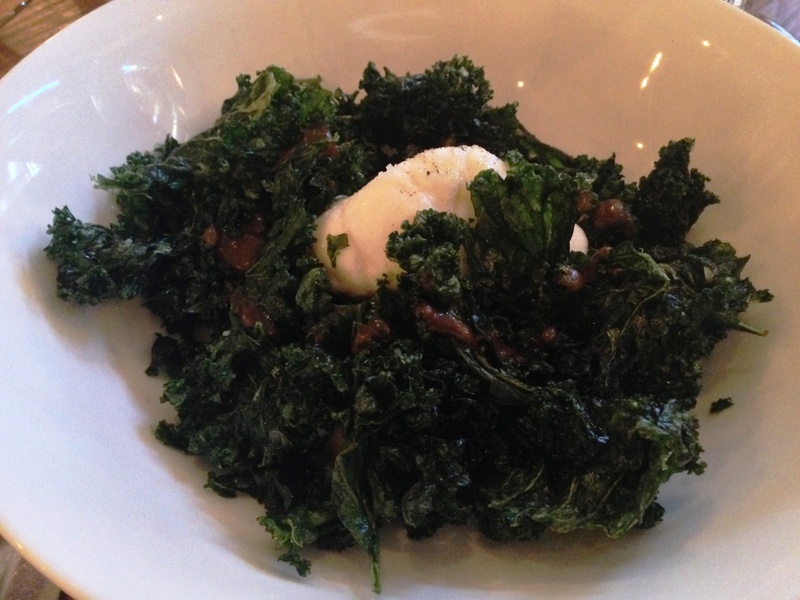 The kale is fried to a decadent yet delicately thin crisp. Hazelnuts and burrata add to the dish’s richness but apples and a tamarind dressing bring acid and lightness in to balance it all out. The much-touted 5 grain risotto is a staple on Mintwood’s menu, although the accompanying flavors and vegetables rotate seasonally. 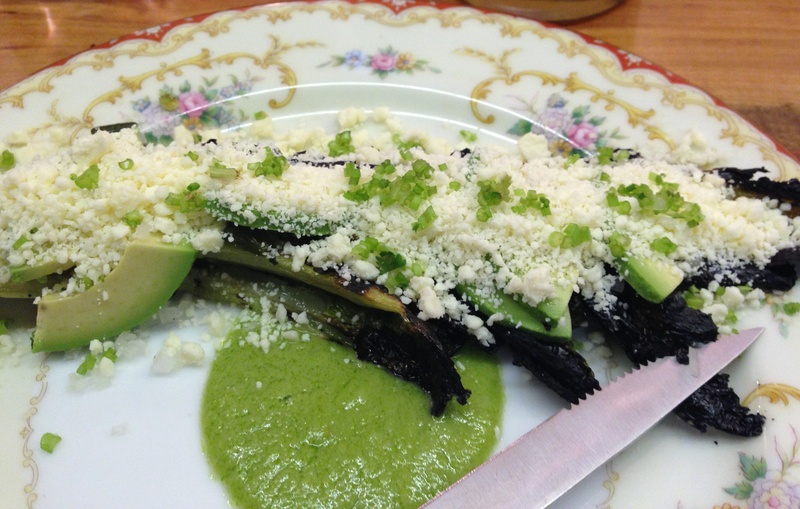 I opted for the spring vegetable composition instead and was presented with a tender bounty – carrots, peas, fava beans, fiddleheads, artichokes, ramps, and more – served over a morel puree that’s intensely mushroomy while also light and frothy. You must order a side of lentils du puy. Cooked to pop-in-your-mouth firmness in vegetarian broth, these tiny brown gems are flavorful in their own right. In the chef’s hands, they are also an excellent vehicle for delivering extraordinary levels of sweet cream. 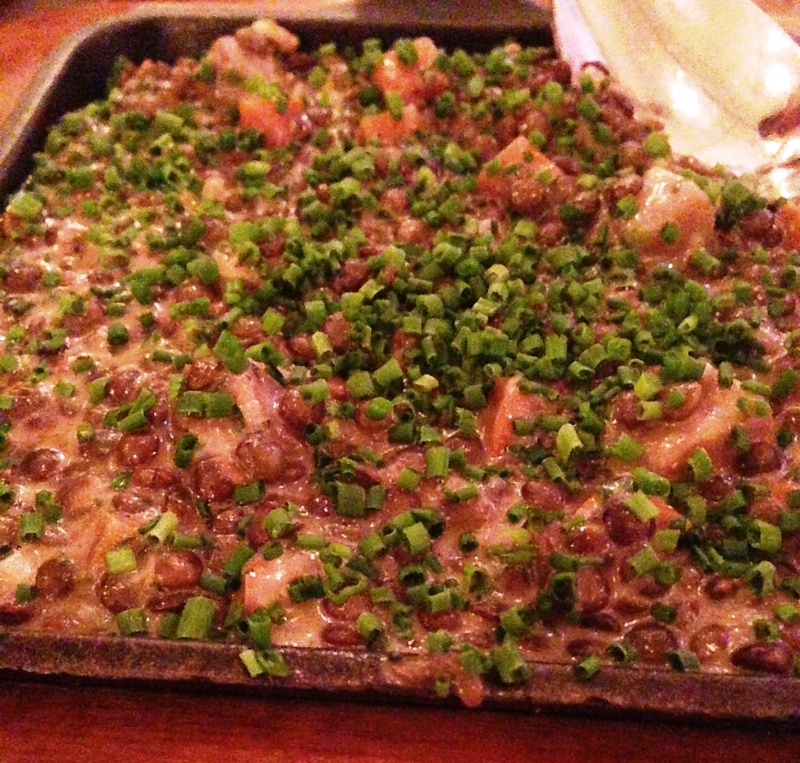 This was the best dish of the night, and possibly the best lentils I’ve had. 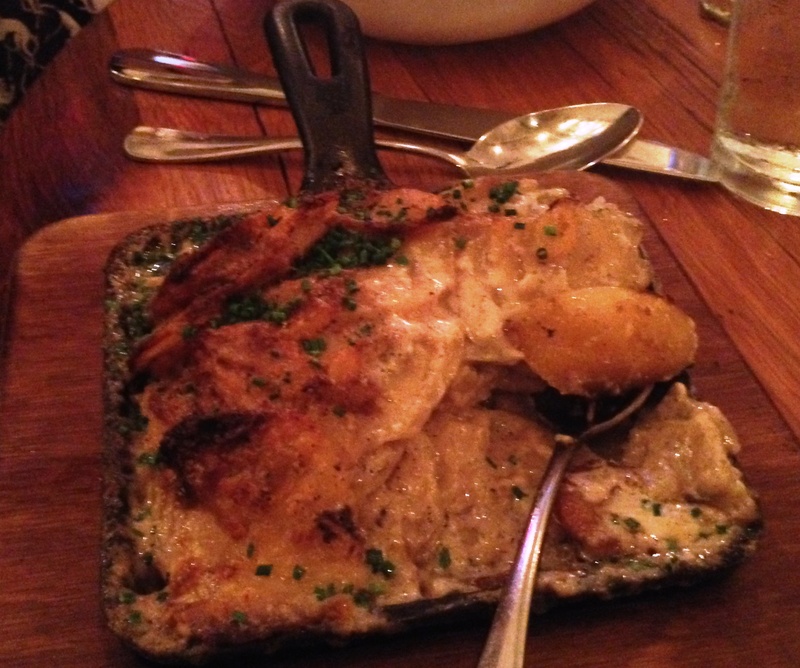 Gratinéed potatoes were also satisfying – crispy, creamy, and dreamy – if a tad oversalted. This was the only dish that went sliiightly over the edge. 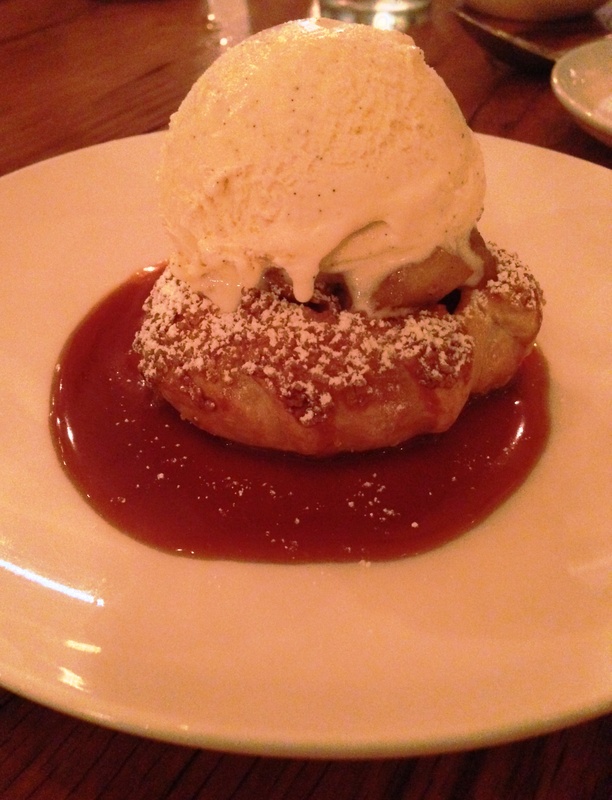 Warm apple & almond croustade à la mode had a flaky crust, caramelized apple filling and homemade vanilla ice cream to top it off. We (er, I) licked the plate. Mintwood Place stands out because Chef Cedric Maupillier has a gift for making every ingredient all that it can be and every dish the best version of itself, while managing to avoid the pitfalls of excess. Go see for yourself. DC’s seemingly insatiable appetite for brunch has led to a glut of restaurants opening at 11 to serve overpriced eggs or just straight up lunch fare (sorry Taan, ramen is LUNCH) along with even more obnoxiously priced sugary ‘breakfast cocktails’. 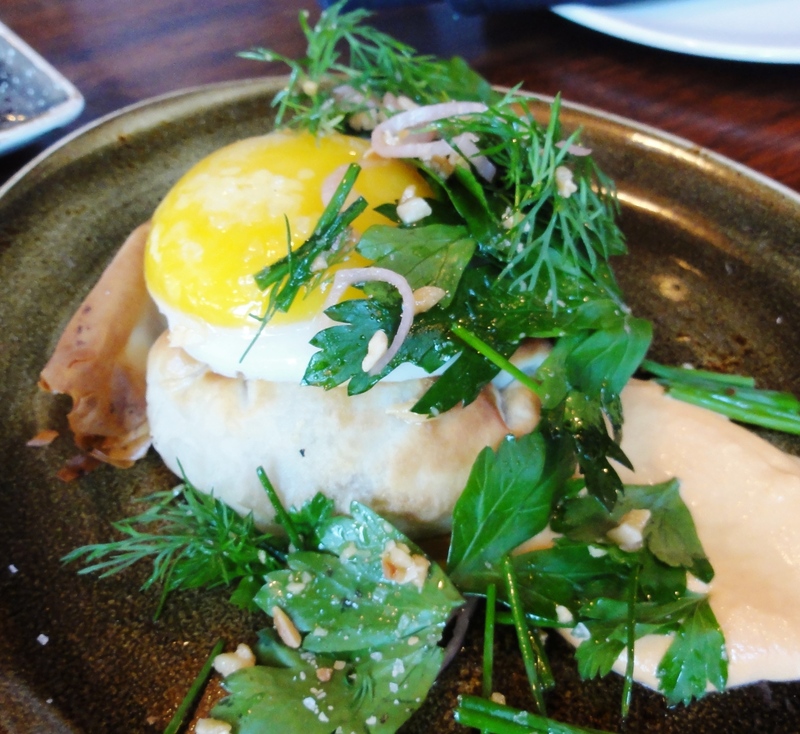 Occasionally, the stars align and you get to enjoy the best of it: an inventive twist on comforting brunch classics at a great spot with no wait because it’s better known for dinner. Enter Kapnos. We were already fans when we noticed that it was open for brunch one weekend and decided to stop in. The good-sized menu includes small and large sweet and savory plates, from Greek spreads to omelets, waffles, phyllo pies, and panini. Start with an actually tasty mimosa – lemongrass pineapple is a showstopper but I may have to try pomegranate cardamom next time – or a boozy herb-infused kegged lemonade. 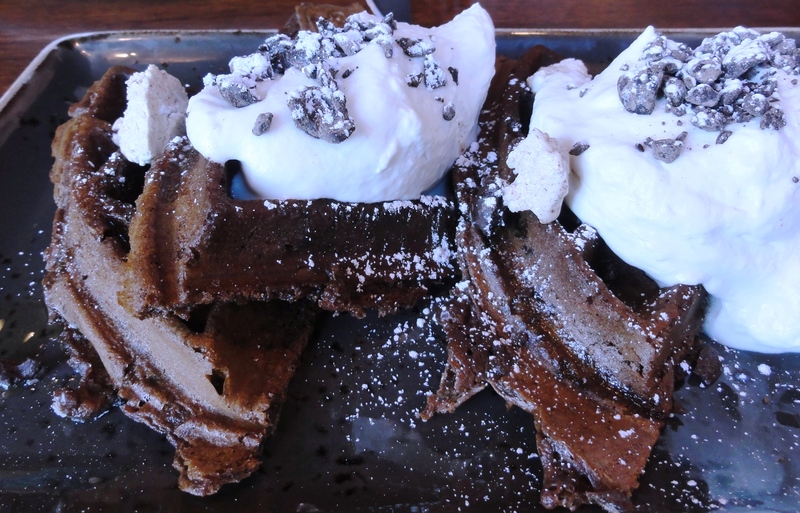 On the sweet side, baklava french toast and Greek coffee waffles are delicious. 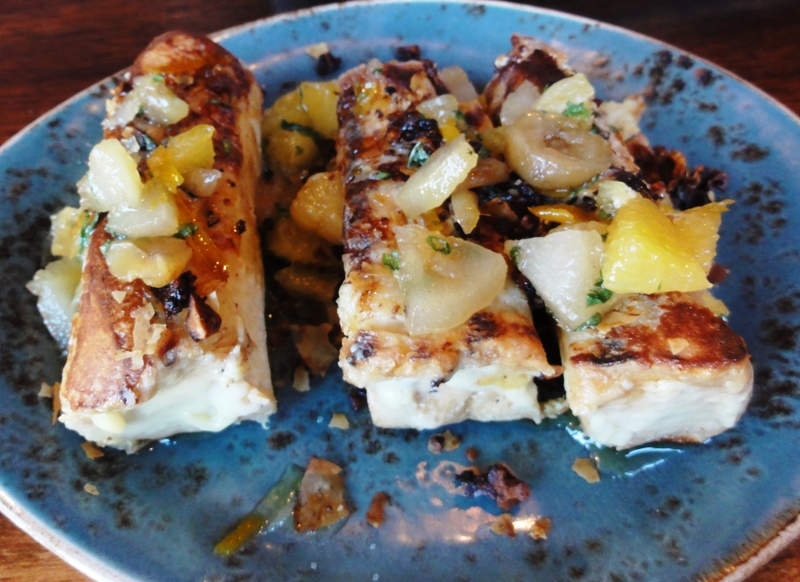 The french toast is fluffy and moist, topped with perfumey candied chestnuts, pears, and oranges. It’s homey and satisfying yet sophisticated. There’s nothing subtle about the coffee waffle. Intense coffee and dark chocolate flavors (there are fine Greek-style coffee grounds in the batter) aren’t dulled by cinnamon butter or whipped cream, both barely sweetened. Chunks of bittersweet chocolate on top remind you that this waffle is for grown ups. We’ve shared an order for the table on two visits now and find it to be the perfect appetizer, mid-meal bite, and dessert. The phyllo pies, both vegetarian, are a great counterpoint to dessert-for-breakfast. They’re small enough to eat as an entree with room for something else to share, or vice versa if you want a few bites of savory to go with your french toast. Both the potato garlic pie with red pepper almond puree and spanakopita with spinach, leeks, and feta are flaky and flavorful. The omelet with mushrooms, spinach, and manouri cheese is solid but unremarkable – next time I’ll try scrambled eggs with zucchini, tomato, and yogurt. Similarly, pressed toast with apples and truffle honey is no more exciting than it sounds. Finally, for those who insist on lunch at brunch, there’s an orzo pasta bake with spinach, feta and leeks. Just make sure you also get a bite or two of someone’s waffles. And an extra mimosa. Vedge gets me. Vedge gets you too; you just might not know it yet. Too bad we have to be in a long distance relationship. Philly’s not that far though, right? Some things to know about our new beau: Vedge is delicious. Vedge’s cocktails are equally delicious. Vedge is inventive. Vedge is not out for all your money. Vedge is warm and friendly. Oh, and Vedge is vegan. We actually argued over this last point at the end of our meal, those refusing to believe murmuring things like “But the ice cream. The creamy sauces”. We started with salted beets and a portobella carpaccio, from an appetizer selection including sweet potato pate with jerk cashews and ‘funky’ kimchi stew. The beets were fresh and bright – a welcome departure from my usual roasted, dense preparation. Together with avocado and cucumber herb sauce, every bite had the right amount of salt, crunch, and cream. 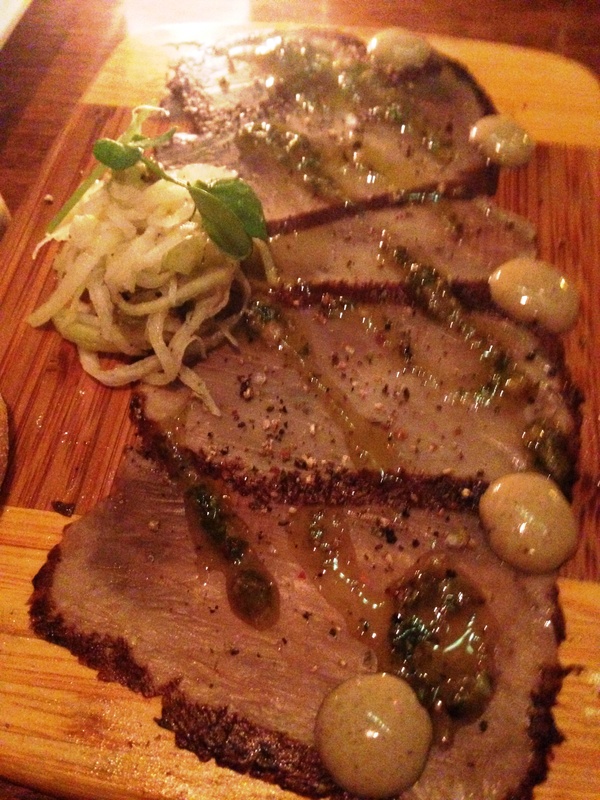 Portobella carpaccio is one of those feats that makes dining out exciting. Sliced paper thin, with a delicately smoky flavor and little blobs of caper sauce and creamy truffle mustard, they resembled nothing like the usual earthy caps served in burgers or stuffed with cheese. Spicy grilled tofu was also inspired. While not quite spicy, the slathering of smoked miso along with gochujang, a fermented Korean chili paste, was a perfect twist on barbecue sauce. Seitan was aggressively but appropriately seasoned as well, marinated until tender and chewy with za’atar and served over tahini cream and swiss chard. This was of the best seitan dishes I’ve tried. 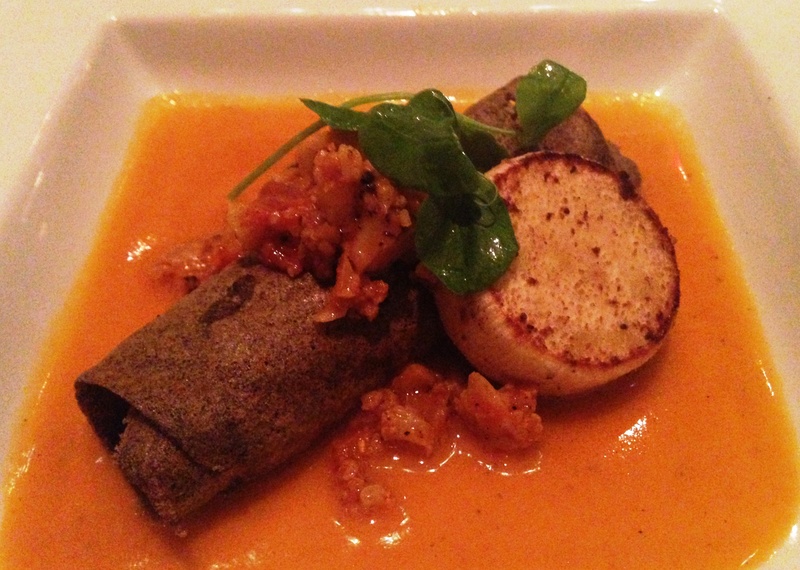 Hearts of palm went surprisingly well with the buckwheat pancake they were wrapped in, but the real standouts here were the gorgeous saffron sauce and cake-like disk of tandoor cauliflower. Eggplant braciole was the only dish that didn’t blow us away; the texture was mealy rather than silky and red peppers overwhelmed the other flavors. 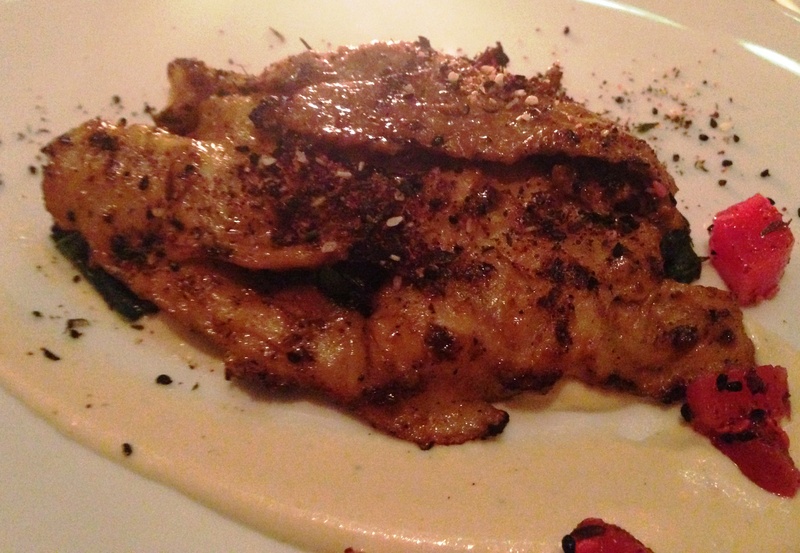 We also ordered a couple of sides off of the ‘dirt list’, both very nice. Grilled kale was buttery and indulgent, and a winter stew with tomatoes and hazelnuts gave me a new appreciation for simmered (rather than roasted) parsnips. Don’t leave Vedge without trying at least two desserts. 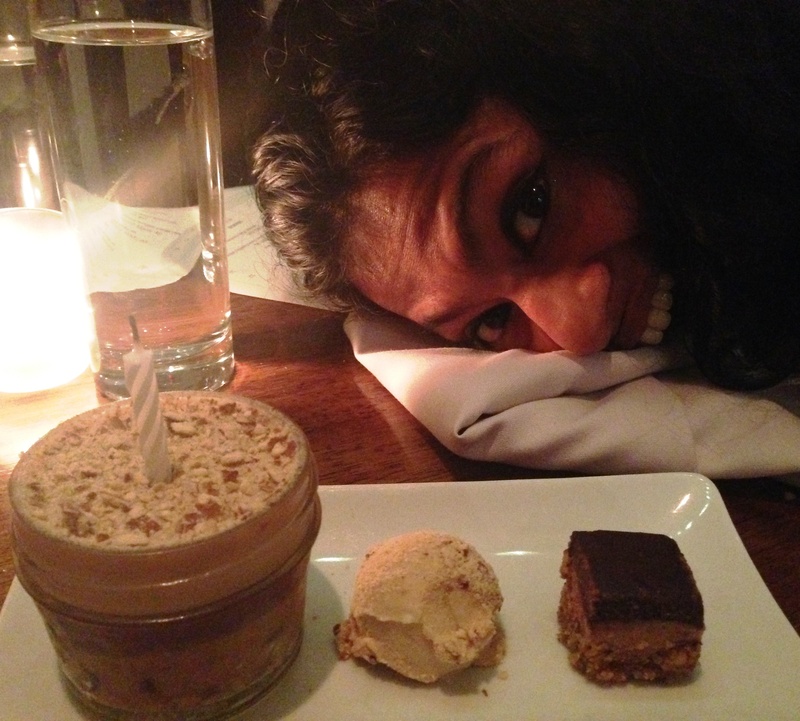 We were very happy with our cheesecake and chocolate peanut butter extravaganza, but narrowing down was not easy. I actually woke up the other day wondering what a choice of sticky toffee pudding with smoked pecan ice cream would have been like. 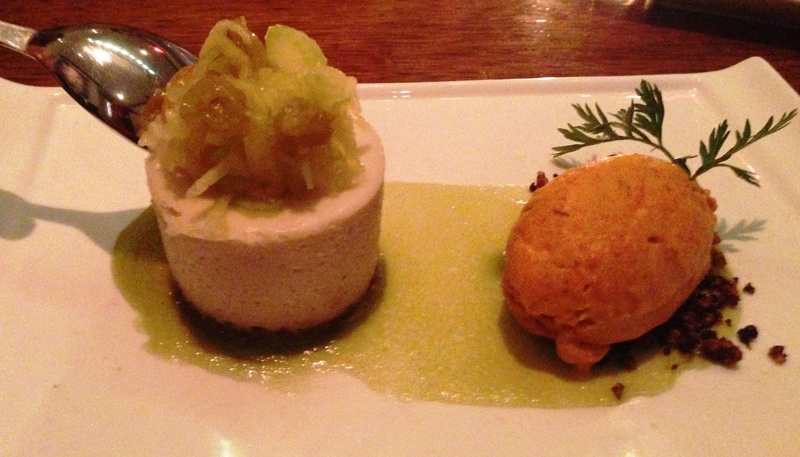 Cheesecake was topped with a zippy mini celery and apple waldorf and served with celery gel (more appetizing than it sounds). Even better was the accompanying carrot cake ice cream over a sprinkle of crunchy walnut dirt. Vibrantly orange and intensely flavored, the ice cream reminded me of both a traditional spice cake and Indian carrot halwa. Unlike many restaurants where the quality of the food isn’t necessarily matched by the drinks, our cocktails were also excellent. All four of us liked all four choices, particularly the floral Kyoto Sour and winter-themed Thackery Binx, which combined rum, figs, port, and dates without being at all syrupy. Unsure of my friend’s plans, I had made reservations at Vedge for both Friday and Saturday night during the weekend of my visit. After our meal, a part of me regretted having cancelled Saturday’s reservation. You better believe I’m going back to Philadelphia soon to visit Vedge. I mean, Shruthi. New York’s Dirt Candy has been on my bucket list for quite some time. But with a teeny tiny seating area and an apparently rabid customer base, getting a reservation here as a weekender is damn near impossible (last-minute cancellations announced by “Twitter Table Lotto” make it more accessible to locals). I made a reservation in August for a trip in October, leaving exactly two months of building anticipation for the meal. The menu is vegetarian, with most, if not all, items available vegan. All of the appetizers and the entrees are named for a single vegetable, which either appears in several variations (cucumber soup with cucumber jelly) or stars in the show with some sidekicks (spinach served with grapefruit, pistachios, and smoked ricotta). 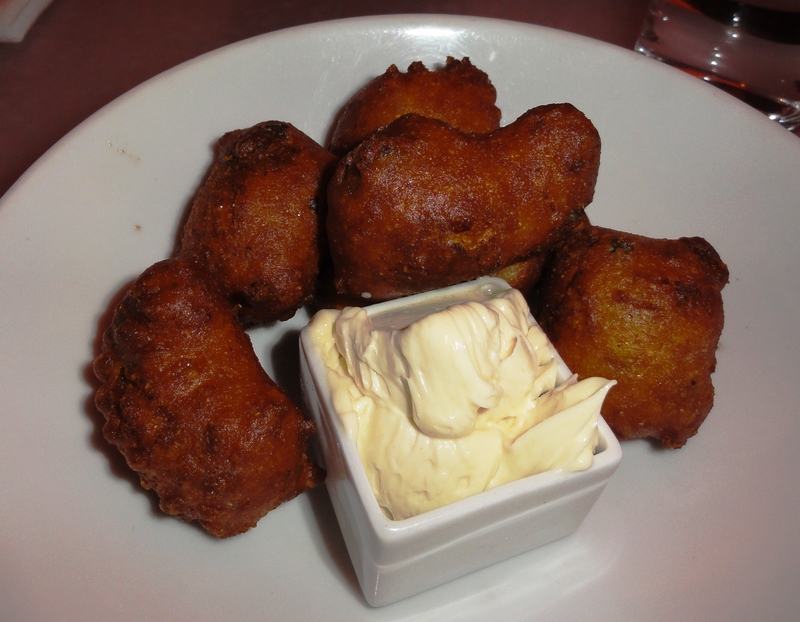 Also, jalapeño hush puppies with maple butter. Just cuz. 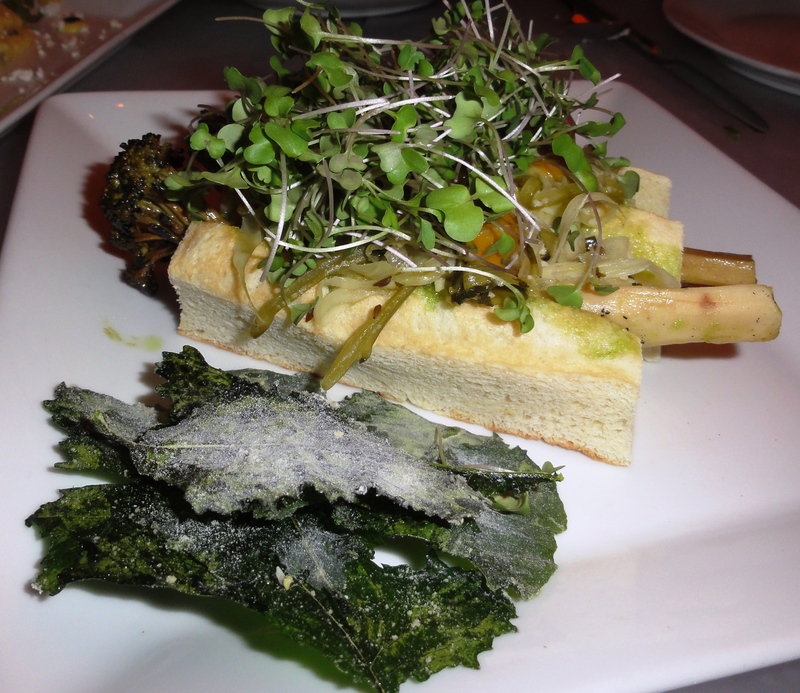 Our second appetizer was more sophisticated, setting the tone for the rest of the meal. Composed of thin strips of potato salad, crispy Japanese yams, grilled chip-like sweet potatoes, along with julienned olives, bitter greens, and apples, this was the lightest, most delicate assemblage of tubers I’ve ever tasted. We ordered all four entrees: beans, broccoli, parsnips, and corn. The first two were outstanding. 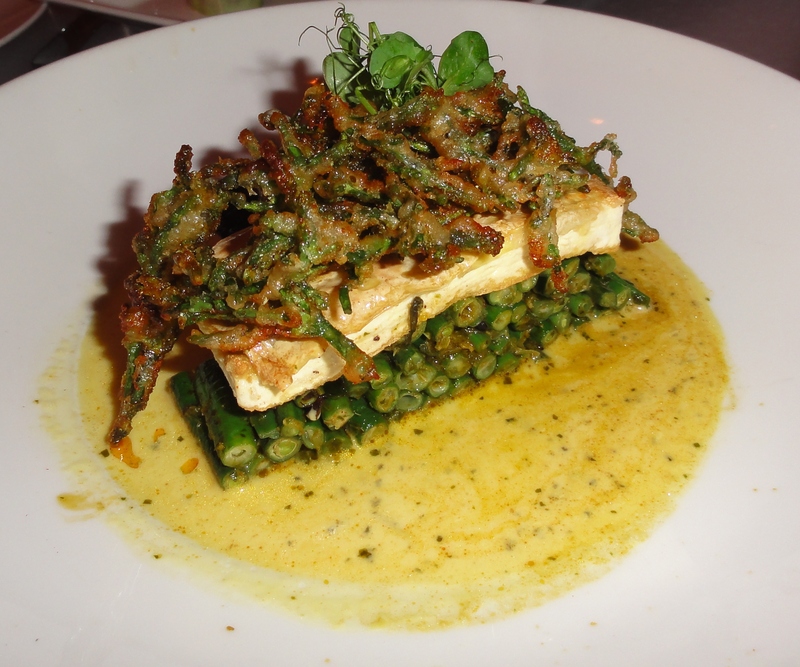 Beans consisted of tofu poached in coconut sitting on a raft of long beans in a little pond of saffron sauce. I’m not being dramatic; this is exactly how it looked. 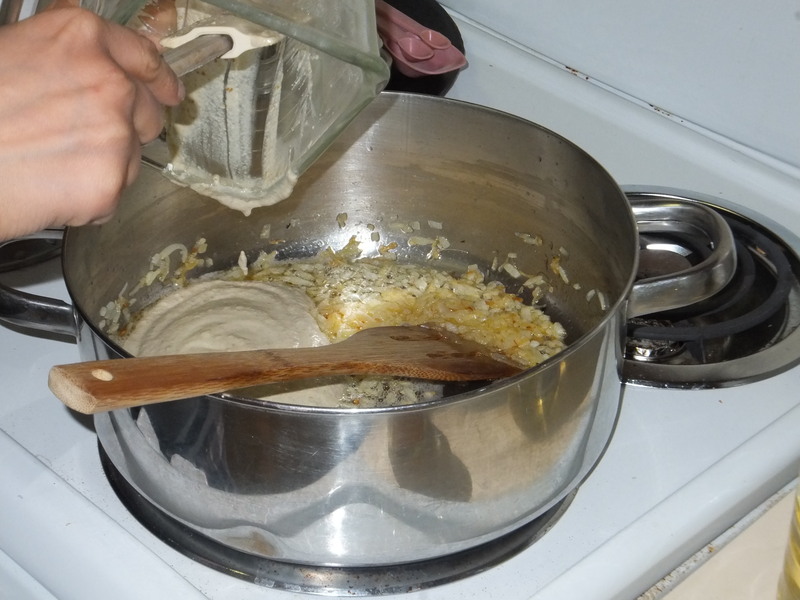 Crispy fried green beans – life rafts? passengers? – finished it off. Each component, including the tofu slab, was perfectly seasoned. This dish was beautiful, creative, and delicious. 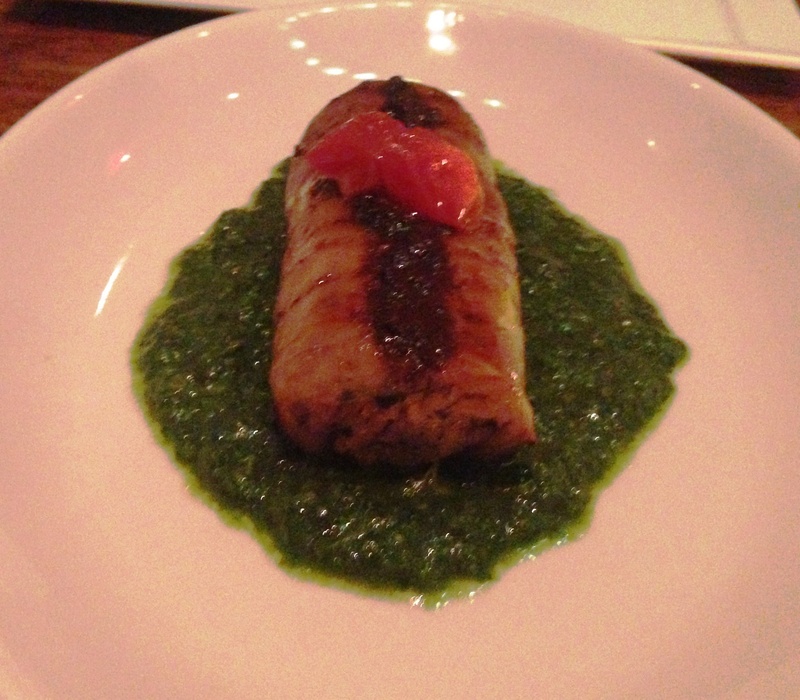 Broccoli came as a barely smoked hot dog wiener (whaaat?) with broccoli kraut, broccoli rabe, and a side of salted crispy kale. Served in an airy bun and topped with vinegar and zippy barbecue sauce, one bite led us to abandon any doubts (square bun included). I can’t remember the last time I ate something this tasty and just plain fun. 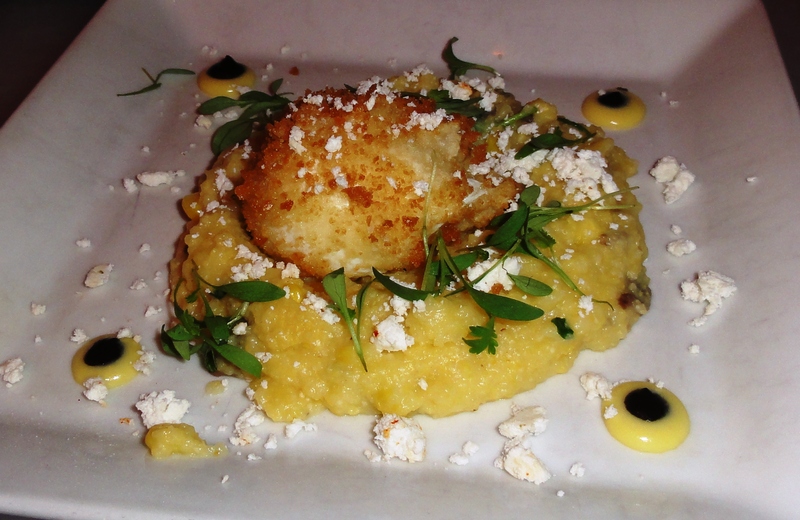 or corn, which sounded tempting (grits, corn cream, tempura egg, huitlacoche corn fungus) but was also a bit bland. Still, the pleasure we took in the appetizers and first two entrees was enough to keep enthusiasm high. 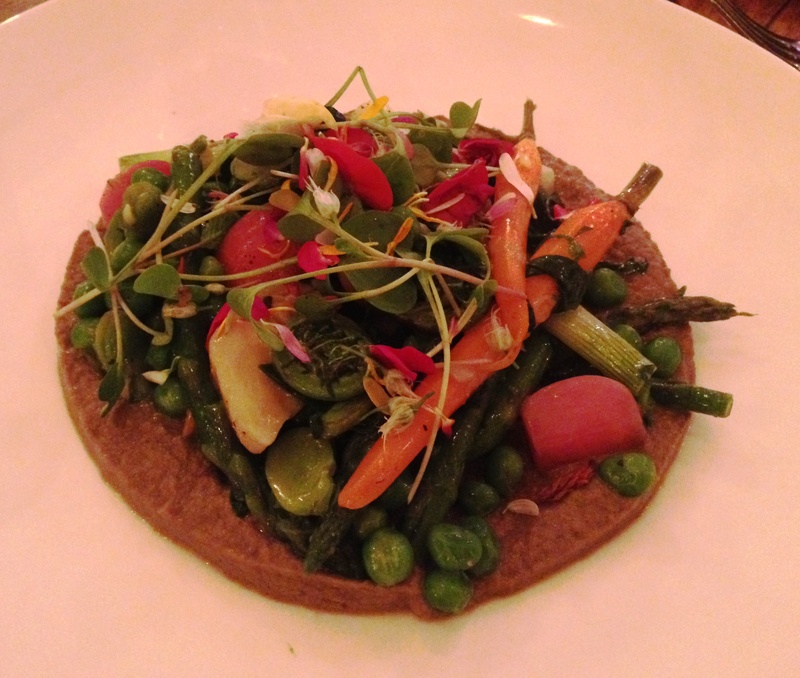 Innovative, flavorful, and fine but not outrageously priced vegetarian dining like this just doesn’t exist in DC. The bad news is that you have to travel to Philadelphia or New York, but the good news is that Dirt Candy is moving into a bigger space late next year, so at least we out-of-towners will have a fighting chance of getting a table. Its name sets the tone for your evening: luxurious, yes, but in a home-y way. Service at Rose’s Luxury near Eastern Market is warm and welcoming, and the menu balances inventiveness with comforting touches. Apparently everyone agrees, because weekends here are packed. With no reservations, the best way to plan your visit is to arrive a couple of hours before you’ll be hungry, put your name down, then settle in for some drinks at a nearby bar (or upstairs if you can get a seat). Planned right, a leisurely built-in cocktail hour just adds to the indulgent feel of the evening. Following this formula, we found ourselves seated with a view of the kitchen last Saturday night. 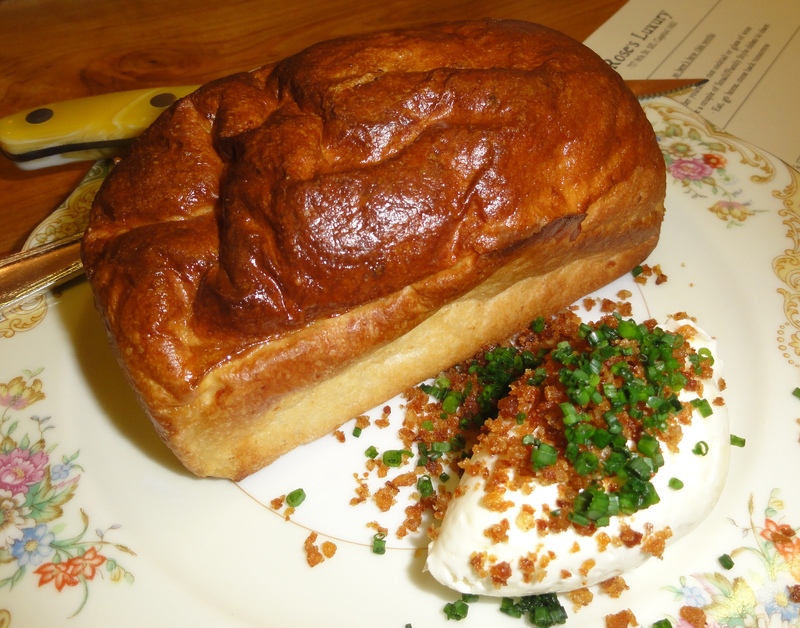 A loaf of complementary brioche with – butter? sour cream? Something in between? arrived on old-fashioned china sprinkled with my new favorite topping: crispy bits of golden brown potato skins. 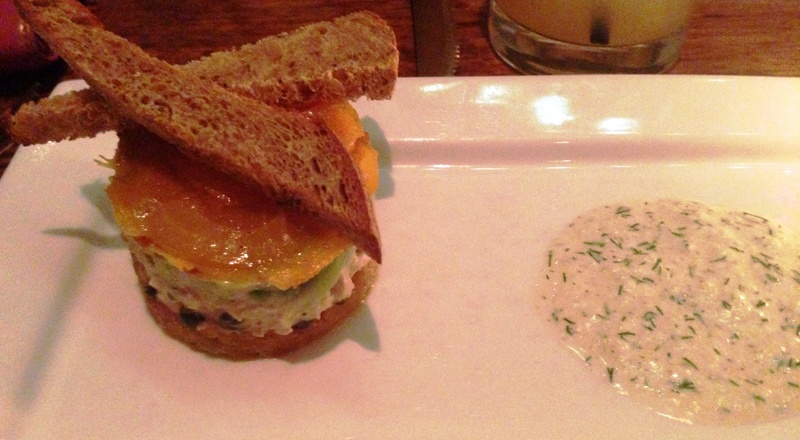 The bread itself was fluffy and chewy and the perfect holdover after drinks at Beuchert’s. Items on the menu that are or can be made vegetarian are helpfully marked in green. After some discussion with our server, we chose dishes that were vegetarian to begin with – burnt romaine, caramelized cauliflower, fennel gnocchi, and strawberry pasta. Although the popular lychee salad can be made with vegetarian sausage, we were warned that it doesn’t live up to the original. Crisp black and green romaine hearts were served with avocado, tangy cotija cheese, poblano for a kick, and a green goddess-type dressing. Who knew charred lettuce could be so good? 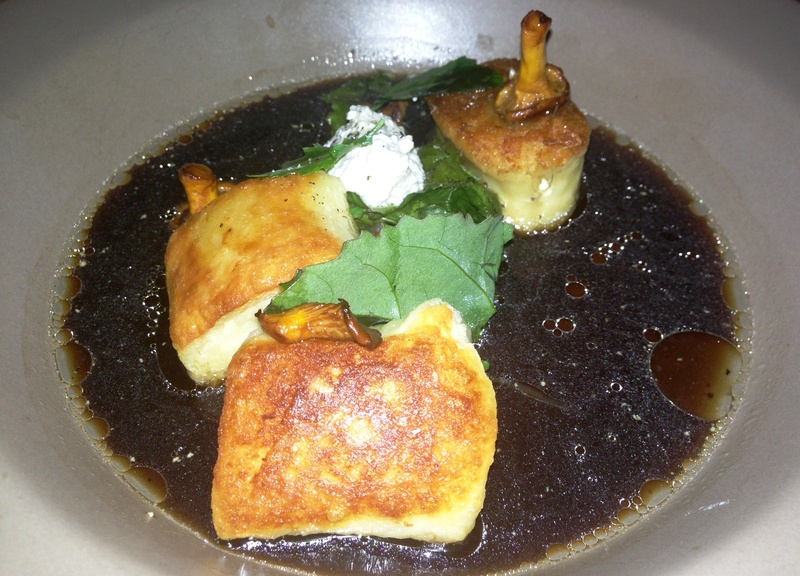 The only dish that was slightly disappointing was caramelized cauliflower. 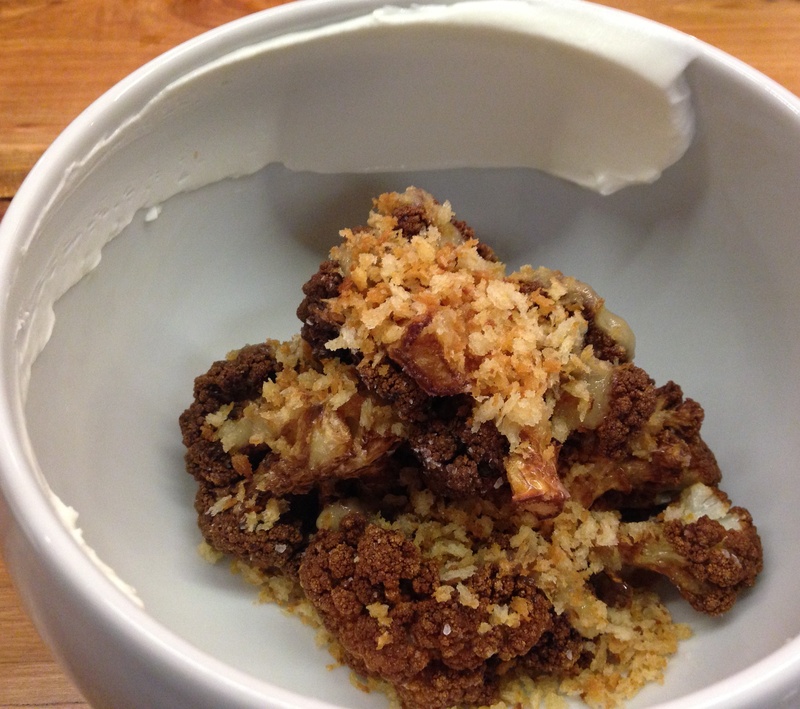 Although every nook and cranny was deep brown and crunchy, the overall effect with Greek yogurt and a hint of something sweet left us wishing for more flavor. 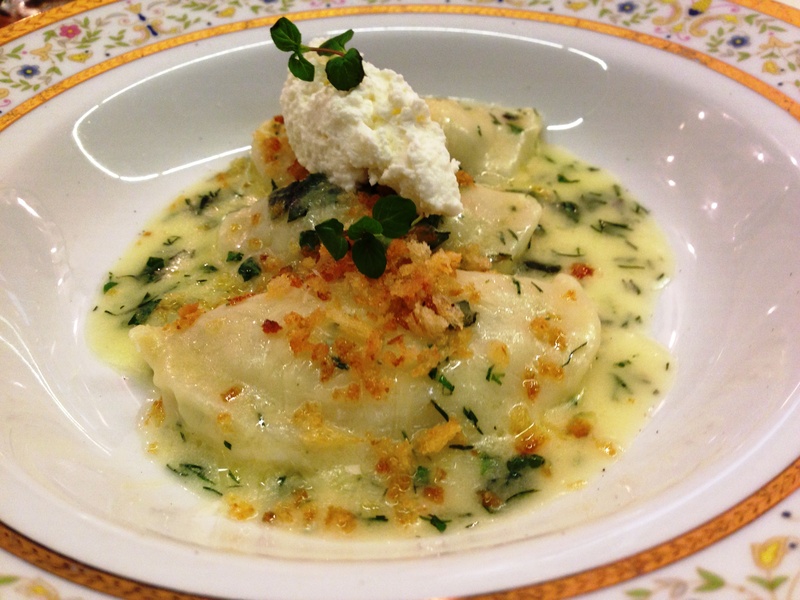 Fennel-stuffed gnocchi was a lot more like a ravioli than traditional potato dumplings. It was surprisingly light and fresh, with fennel flavor coming from the filling and snips of fennel greens in the lemon mint sauce. 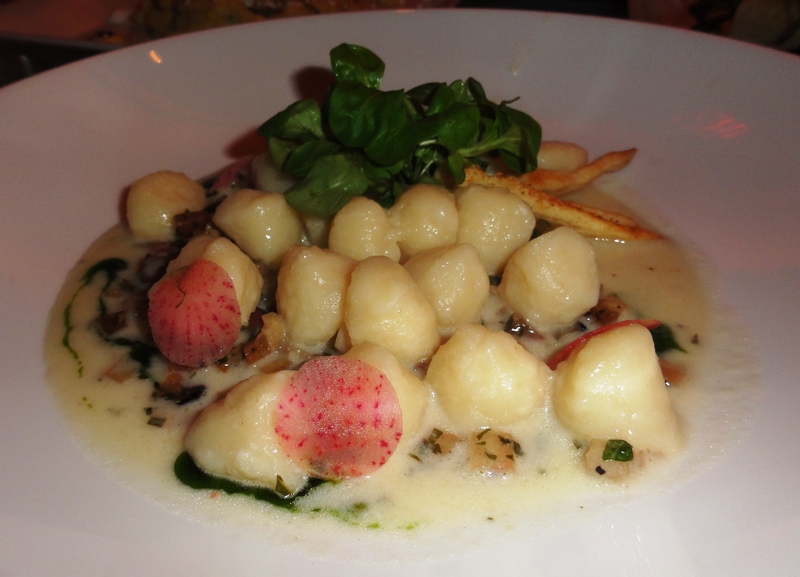 Some things shouldn’t be shared, and this gnocchi makes the list. Get your own. 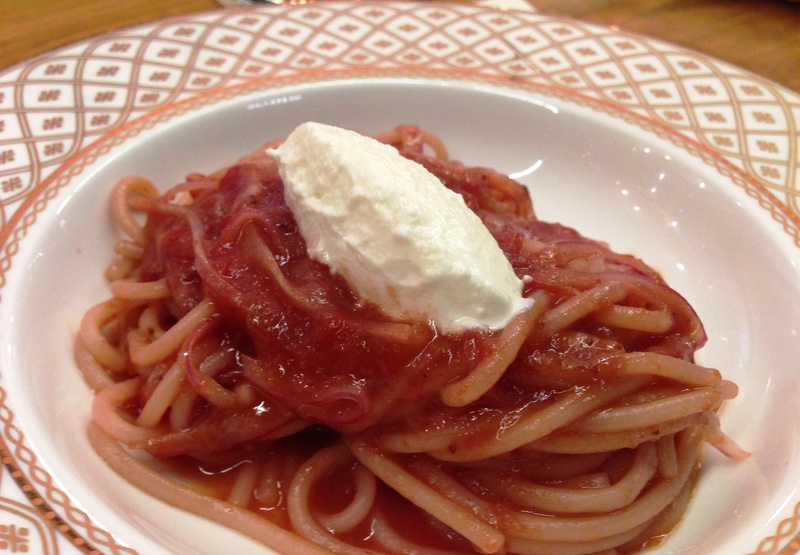 Strawberry pasta was surprising as well – bouncy al dente spaghetti swathed in a sauce of strawberries, red onions, and olive oil, topped with ricotta. The effect was strikingly similar in look and taste to a tomato marinara, with just enough berry sweetness among comforting savory flavors to keep us interested. 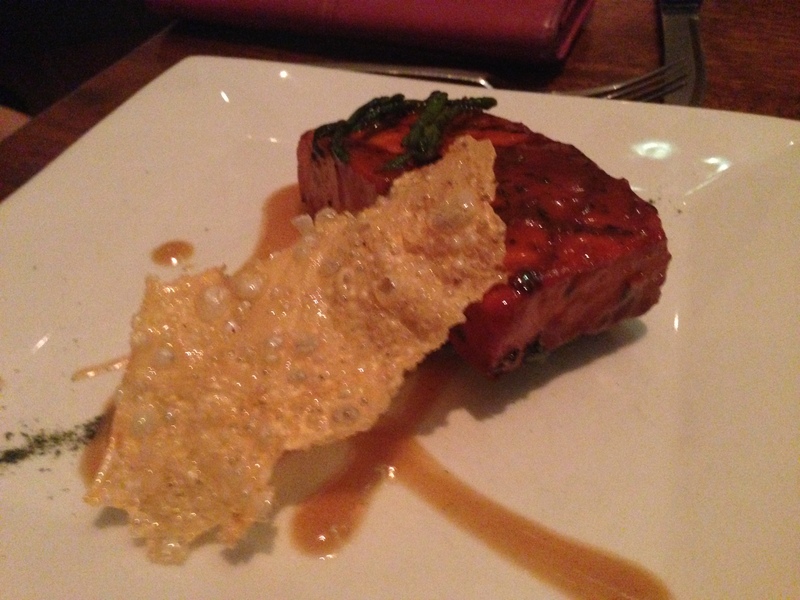 Despite the packed house, both our service and our food were of impressively high quality. Our server’s attention made us (and all of his diners, we suspect) feel special. Every dish was executed beautifully, also clearly given special care in the kitchen. Speaking of the kitchen, our view provided us with even more incentive to come back: watching pasta swirl around in skillets of rich golden cacio e pepe (cheese and pepper) sauce. Next time. Along with dessert! Amongst all the yummy food and drink I enjoyed on my trip to San Francisco in August, one meal stood out that I’ve been wanting to write about: dinner at Bar Tartine. Owned by the couple behind Tartine bakery (where the croissants really are as good as you’ve heard) and with a new chef on board, Bar Tartine serves Eastern European-influenced food with a California twist for a far more exciting meal than its name belies. 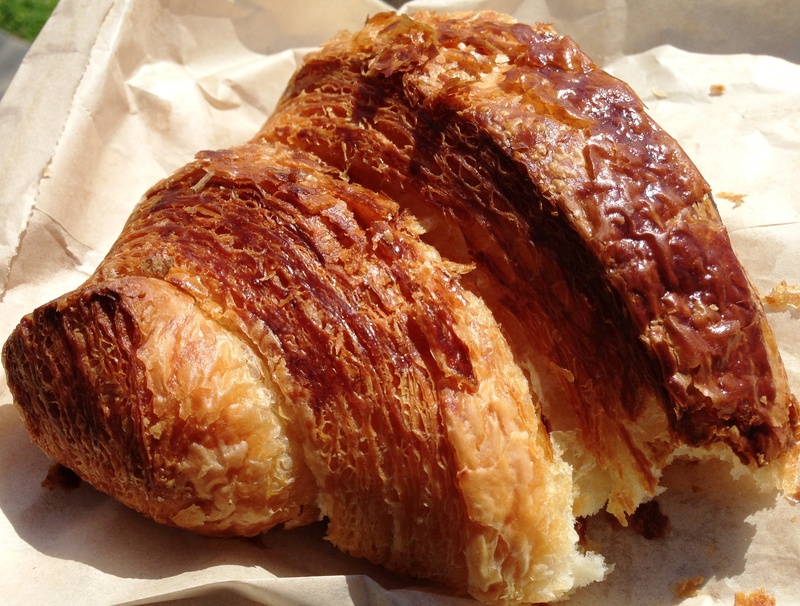 Spectacular croissant from Tartine Bakery. Morning bun was also awesome. You can’t go wrong here. 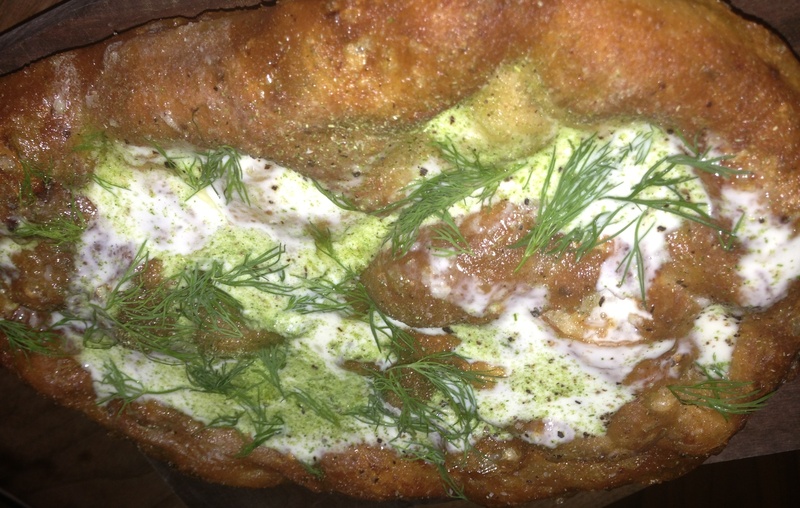 Potato flat bread was another surprise: a puffy fried crust resembling an Indian bhatura, topped with garlic, dill, and sour cream. It’s indulgent, and worth every calorie. earthy and pleasantly bitter flavors, the custard more starchy than creamy and the greens smugly fresh enough to be picked from some sunny Bay Area backyard. Farmer’s cheese dumplings in broth was the only item that wasn’t quite perfect. 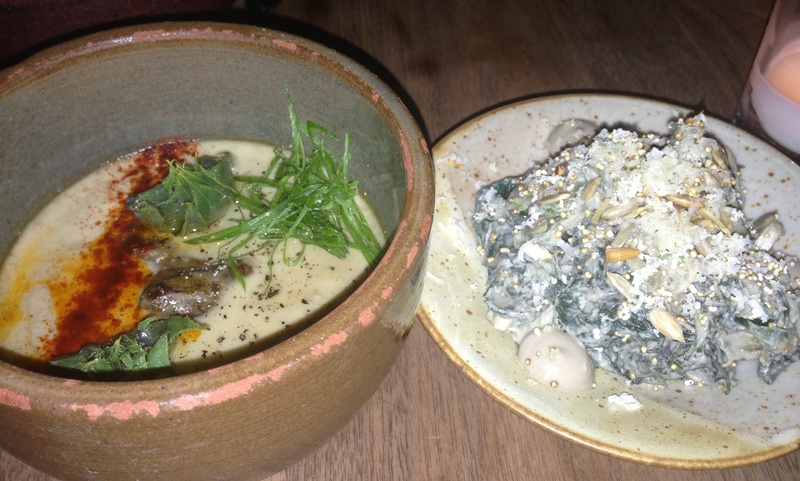 The broth was excellent, more deeply flavored and complex than any I’ve tried. 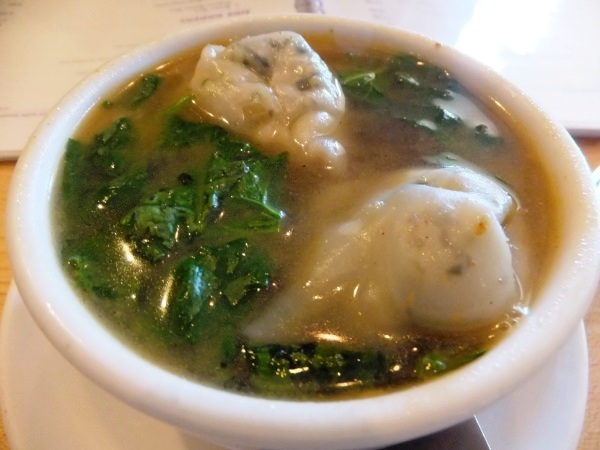 The problem was with the dumplings, which were too big and too dense to properly soak up the broth. The dish didn’t meld, but the components were still pretty tasty. 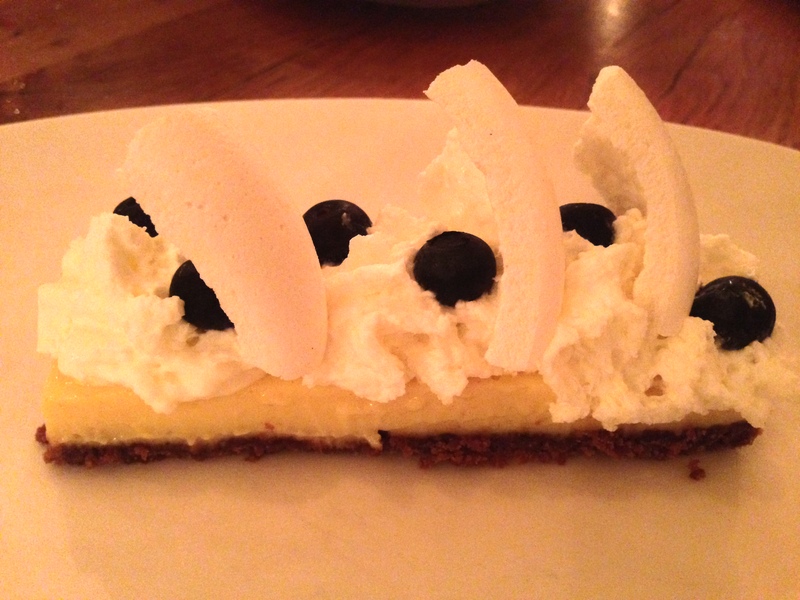 With successes and surprises at every turn, there was no excuse to skip dessert. Unfortunately, the menu that day just wasn’t doing it for us. Carob mousse? Rye porridge? Cucumber sorbet? We passed, but looking back from across the country, I’d say with a little regret that we should have taken the jump. San Francisco is full of great restaurants with vegan and vegetarian food, from fine dining to streetside tacos. 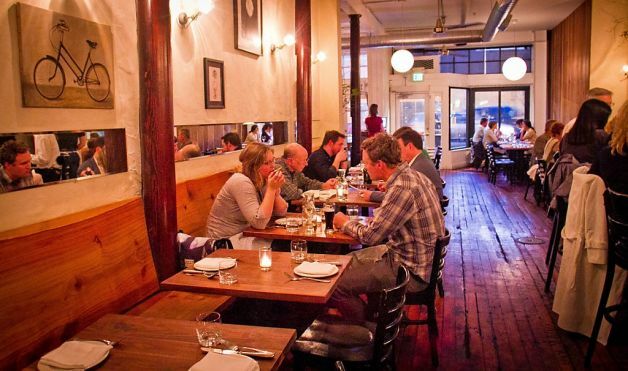 We’re dying to get back and then write more reviews, but in the mean time keep Bakery and Bar Tartine on your list. Some might say there are few reasons to venture the non-metro-accessible depths of Virginia, and even fewer reasons to brave the Seven Corners. Sunflower vegetarian in Falls Church is one of them. This cheery restaurant (no subtlety in the decor here) is a mecca for vegans and vegetarians alike, especially when you’re craving a variety of proteins to go with your veggies. Update: Okay, we’re being a leetle dramatic about accessibility. You can actually walk from East Falls Church Metro – it’s about 25 minutes. So far we haven’t ordered anything we haven’t liked from the huge menu, although we do tend to stick to Asian-influenced rather than American and Italian-style items. 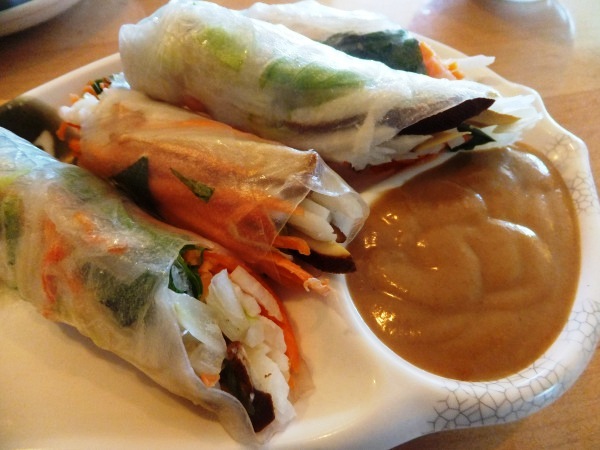 Cold basil rolls are some of the best we’ve found, with lots of vegetables, spiced tofu, and vegi ham. The savory peanut sauce is also the best we’ve had at a restaurant, second only to Anupama’s homemade magic stuff. Wonton spinach soup is comforting and light, although next time I think I might try Tom Yum or the ‘Hot Hot Shabu Shabu’ featuring tofu skins and vegetables in a spicy broth. Colorful vegetable lo mein is about as satisfying as it gets. 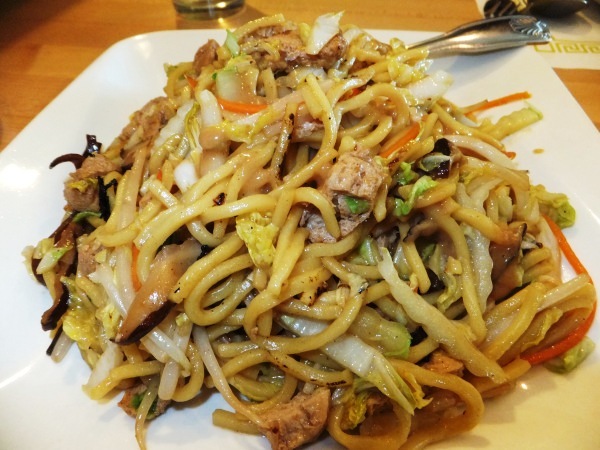 Think pleasantly thick chewy noodles loaded up with vegetables, wood ear and shiitake mushrooms, and tofu, instead of oil and MSG. Try Anupama’s trick and order it with broccoli (though it’s perfectly tasty without). Our favorite item so far might just be Adventure of Tempeh Land. My previous encounters with tempeh have always left a bad taste in my mouth, literally. No bitterness here though. The 5-grain tempeh imported from Japan is nutty and almost flaky in the way it falls apart, but still somehow moist. Apparently the trick is to steam the tempeh first and then deep-fry it, but we’re still looking for the right tempeh in area stores (tips, anyone?). 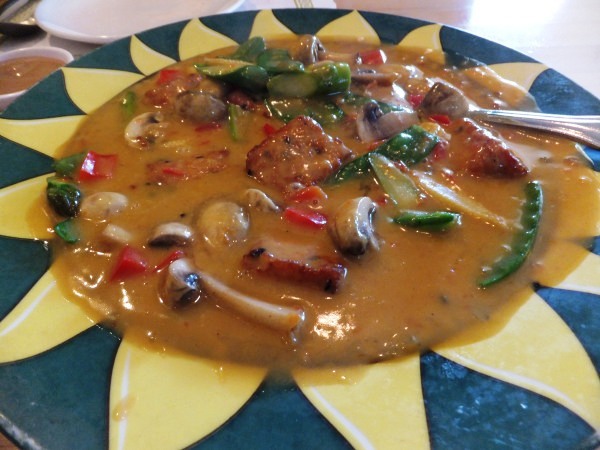 This dish was also loaded with vegetables including asparagus, snow peas, red peppers, and mushrooms, all in a Thai coconut curry sauce that was delicious with brown rice. Once again we walked out full and happy and making plans for our next visit. There are so many more dishes on the menu that piqued our interest, including udon and soba noodles and specials like As-You-Wish Garden with pan-fried noodles in a basil ginger sauce or Amazing Mushrooms Palate in Thai basil barbecue sauce. So get a navigator and set out. 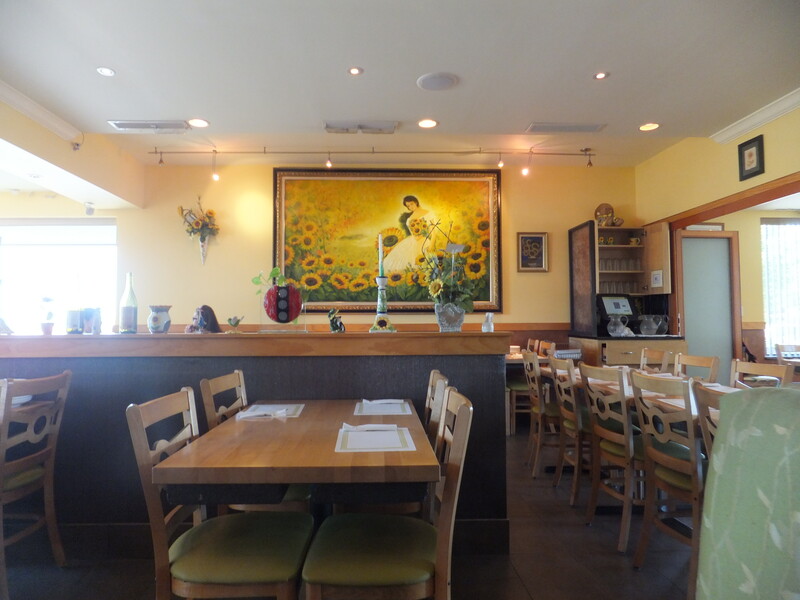 You’ll probably get lost on the way, but Sunflower Vegetarian is worth it! Note: we’re not sure why, but the Vienna location is a totally different and sad story. We’ve tried a couple of the same dishes we had at the Falls Church location and they were greasy, bland, and sometimes oddly bitter. It’s possible that we just ordered the wrong things, so if you’ve had a better experience in Vienna, we’d love to hear it! When I find myself in an Indian restaurant, even the wonderful Rasika, I am usually a bit saddened at the lack of true south Indian food on the menu. Dosa, idli, sambar, simple stir-fried vegetable dishes, rice and all sorts of beans and lentils were what I ate growing up. 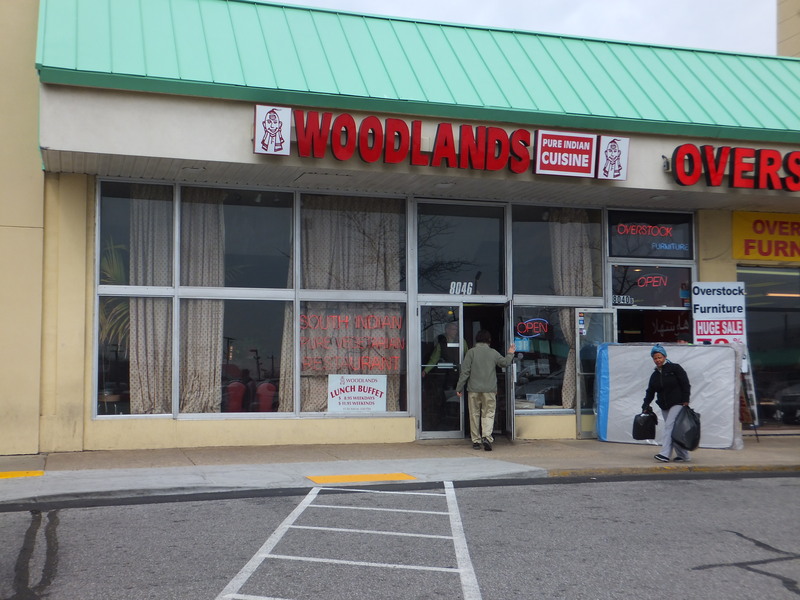 Thankfully, whenever I get a hankering for good South Indian food (and don’t feel like making it myself), I can always head to the ‘burbs for Woodlands. Woodland’s, situated in a strip mall (so you know it’ll be good). 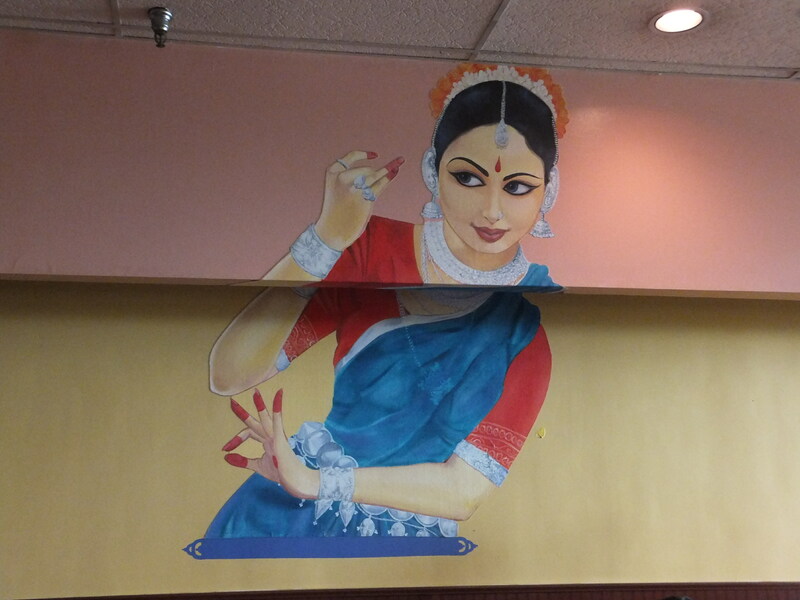 You’ll find this all-vegetarian gem at the edge of an unassuming strip mall, where the best non-Western ethnic food is often found. Getting there is easy enough if you’ve got a car, but it’s worth taking a train and a bus if you have to. 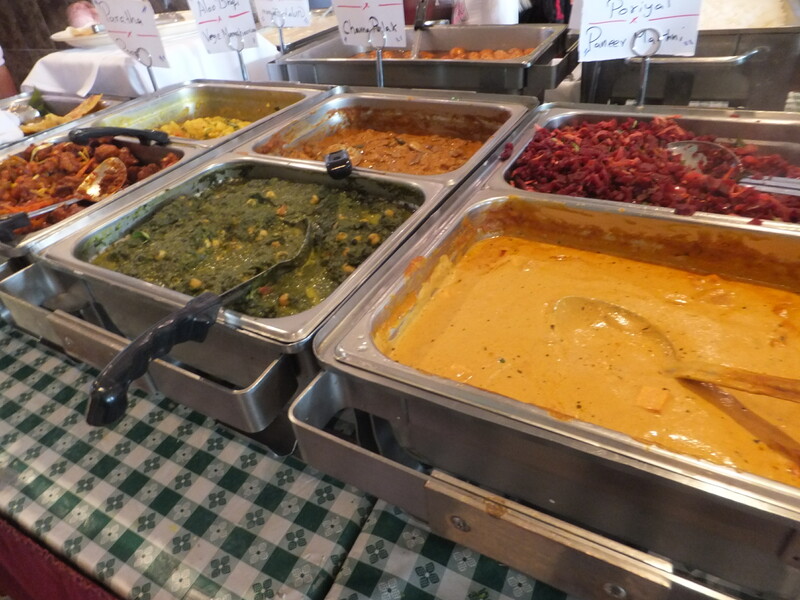 The weekend buffet is a must on your first trip to Woodland’s. 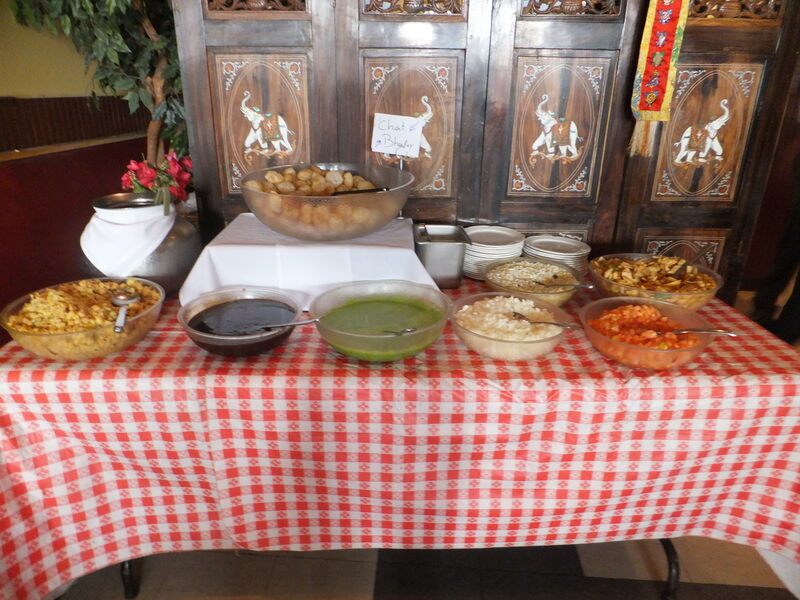 Sample dozens of tasty dishes and go for seconds of whatever you like. That way, ordering a la carte on any subsequent visits (and you’ll want to go again) won’t be so daunting. A coy glance from Radha. Because, why not? We started with the artfully-presented pav bhaji, a spicy roasted mix of potatoes and vegetables (bhaji) that you slather on top of buttery toasted buns (pav). 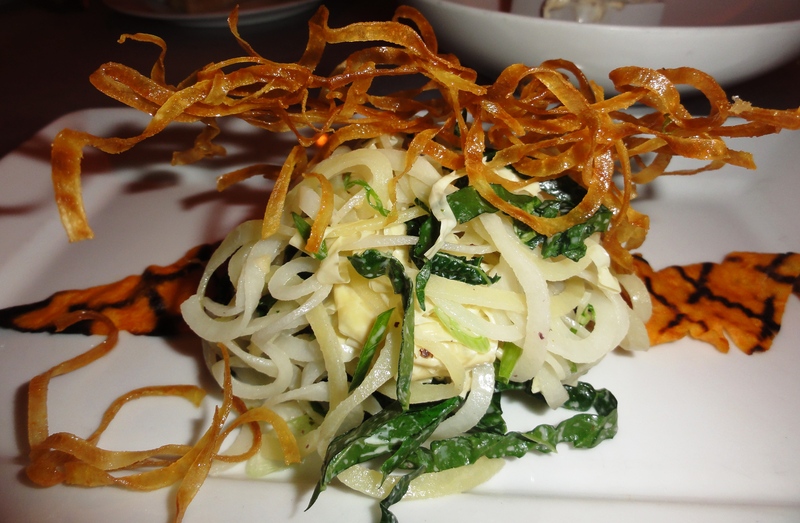 Make sure to top your creation with some of the chopped onion that surrounds the bhaji. The trick here is to avoid overloading on any one dish or trying to pile every dish on your plate during your first round. You can get more later. Next (and we’re still in snack/appetizer-land here) came the chaat table. The word “chaat” describes a variety of savory street-snacks, including pani puri (tiny, crispy puffed breads that you stuff with chick peas, potatoes, onions and tomatoes and fill with thin cilantro-mint chutney and gobble in one go), bhel puri (puffed rice with spicy chick-pea-flour chips, potatoes, tomatoes and chutneys), and papri chaat (fried wheat chips with the same garnishes). 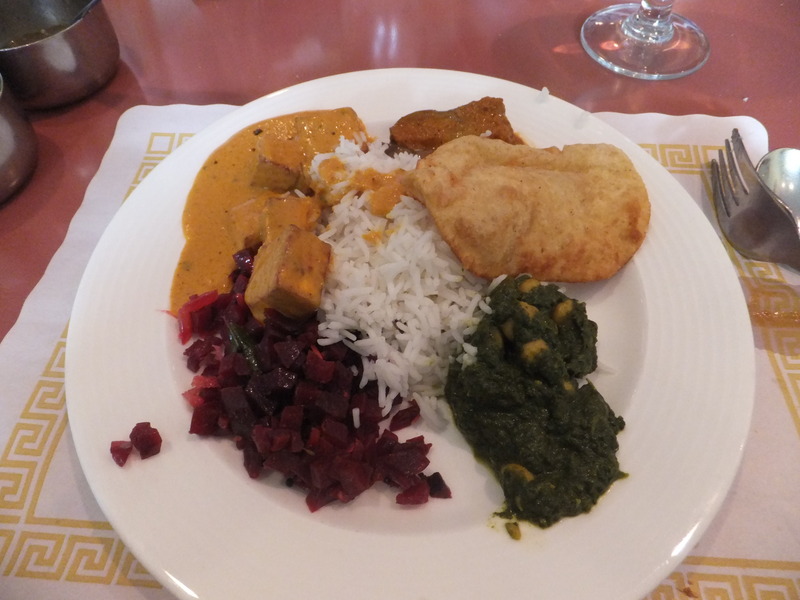 Time for some real south Indian main-dish items, and this is why you’ve got to pace yourself. 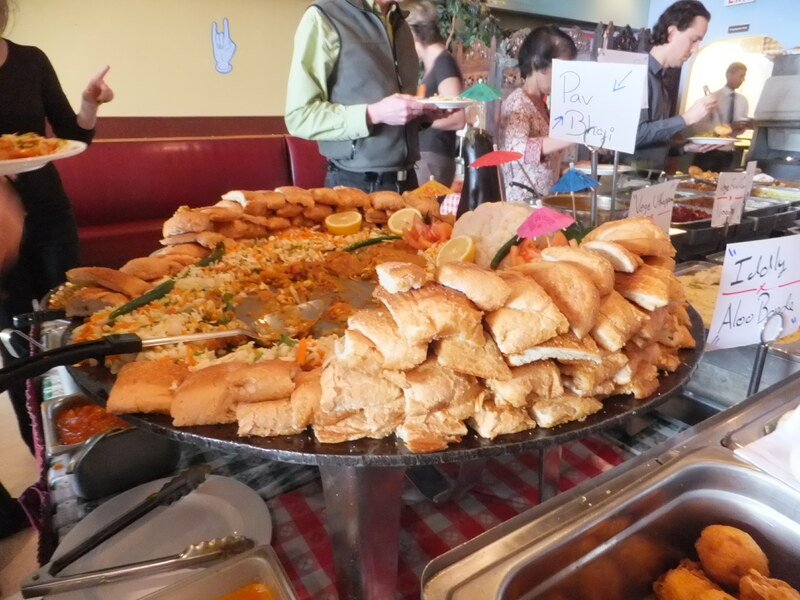 You might have to hover covertly around the buffet for them to bring out fresh dosas and uttapams, which are different kinds of rice-and-white-lentil pancakes. Get at least one fluffy, white idli too while you’re at it. Don’t miss the poriyal, a stir-fried vegetable (often beets, cabbage, or green beans) with coconut or the paneer makhani (fresh cheese with creamy tomato sauce). Channa palak (chick peas and spinach) and Gobi manchurian (Indian-chinese fried cauliflower in a hot-and-sour sauce) were tasty as well. 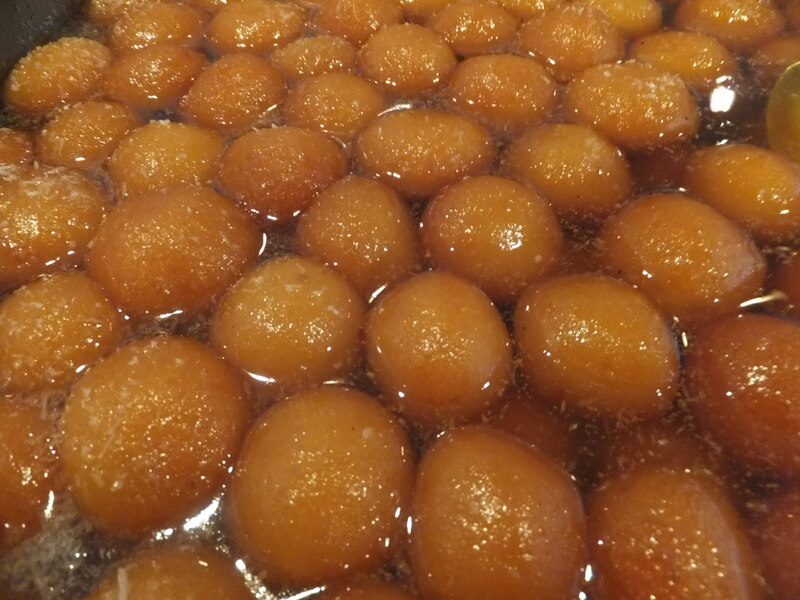 As hard as it is, save room for dessert – especially if you see gulab jamuns. A giant dish of these tempting doughnut-hole-like balls floating in cardomom-infused sugar syrup was waiting for us at the end of the buffet, and we went for it. So anytime you feel like you need to eat All The Things or maybe just want to go where you can eat everything on the menu and everyone knows that vegetarian food is filling and varied, head to Woodlands. 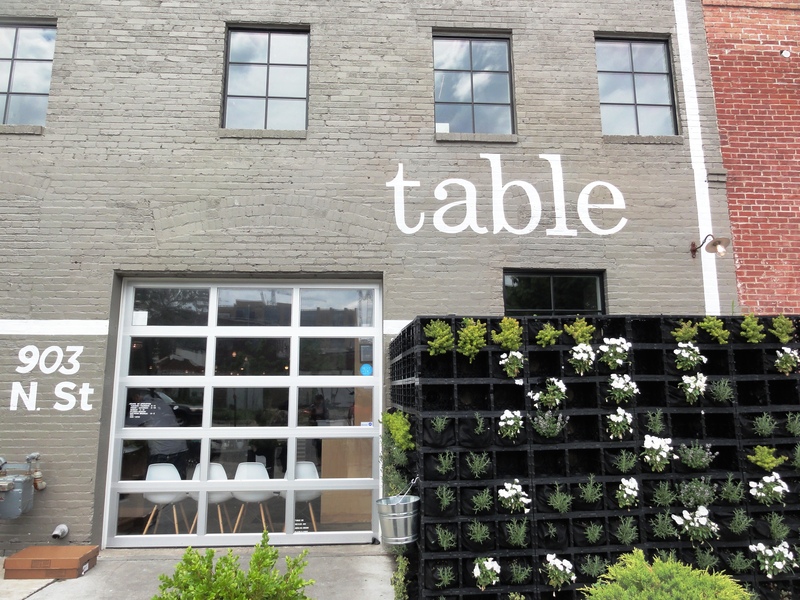 Table your errands for brunch at…Table! Frederik de Pue’s simple yet elegant Table was so enjoyable for dinner that I couldn’t wait to check out the newly debuted multi-course brunch and patio seating area. A friend was in town a couple of weeks ago, giving me the perfect excuse to indulge. We munched on a cute Nutella-filled brioche and mini croissant baked with honey while perusing handwritten menus. 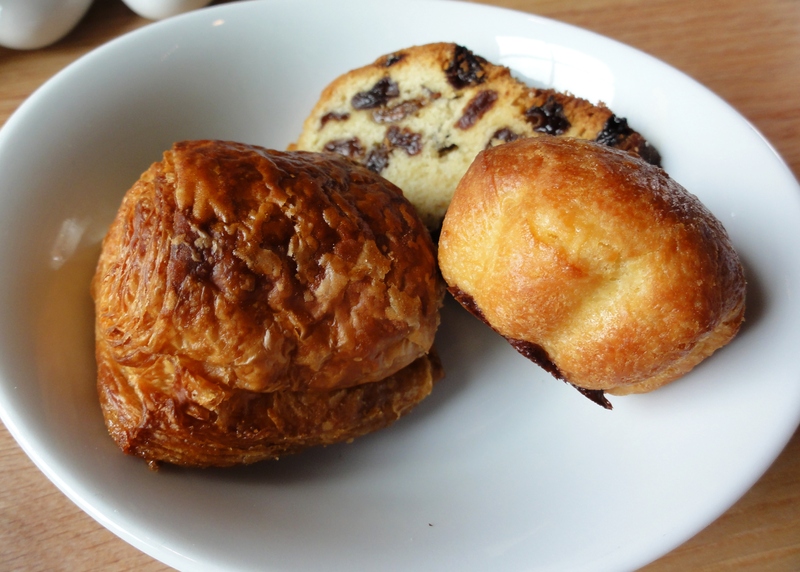 Warning: the pastries are almost Too Small to Share. Luckily I was the only Nutellahead in the group so we didn’t come to blows. 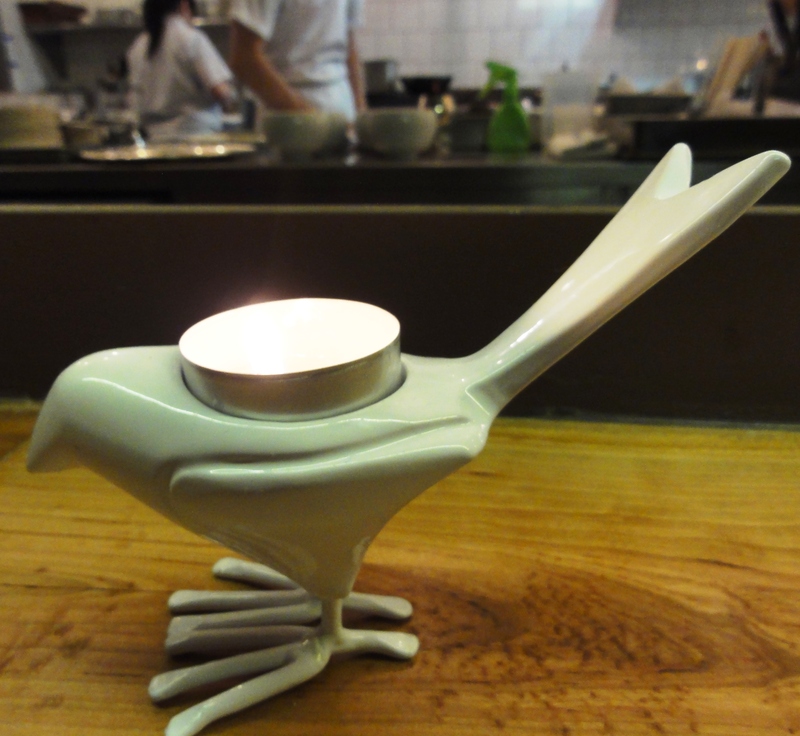 What I love about Table is that seemingly mundane items are so perfectly executed. Case in point: the only vegetarian first course is a yogurt parfait. Yawn, right? But it turned out to be the BEST THING ON THE MENU. The homemade yogurt is creamy and tangy and flecked with vanilla bean. 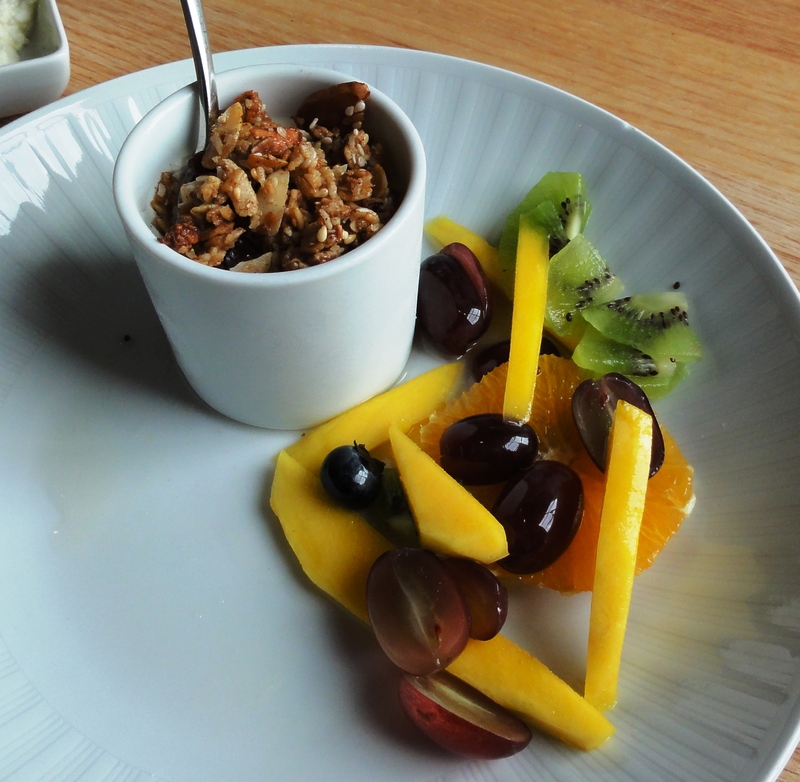 It’s topped with nutty homemade granola and served with fresh mango. It is heaven. 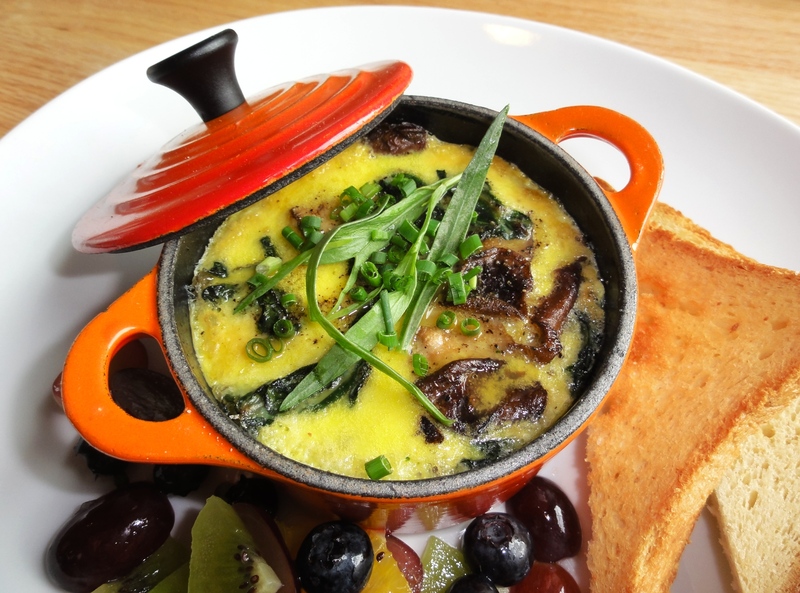 Also outstanding (and not just because of the adorable ‘cocotte’) is the baked egg en cocotte. Break through the surface to bathe the egg, tarragon and wild mushroom mixture in a mustard sherry sauce. 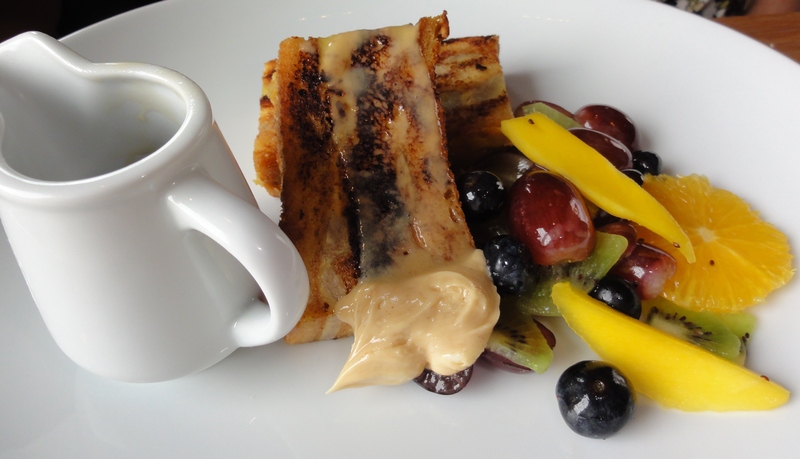 Moist, dense french toast was almost the texture of bread pudding, with bananas baked right in and a dollop of not-too-sweet whipped peanut butter on top. 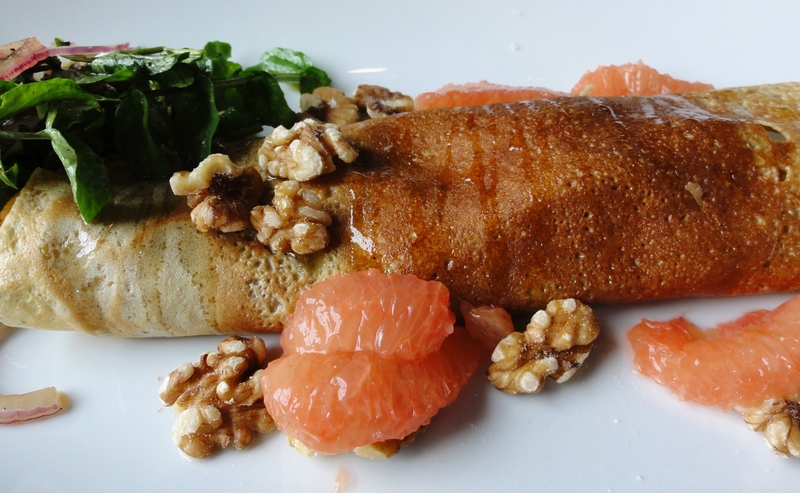 The buckwheat crepe, stuffed with pears and goat cheese and topped with grapefruit, walnuts and honey, was actually the least exciting of our dishes. Although the salty/sweet pairing of cheese with fruit was pleasant, there wasn’t enough sauce to perk up the flavors and bring it all together. With multiple courses and relaxed atmosphere, Table is the perfect place for a leisurely, indulgent, but not overly heavy weekend brunch. Throw in a bottle of bubbly under $40 and be prepared to while away your afternoon in a most civilized fashion.